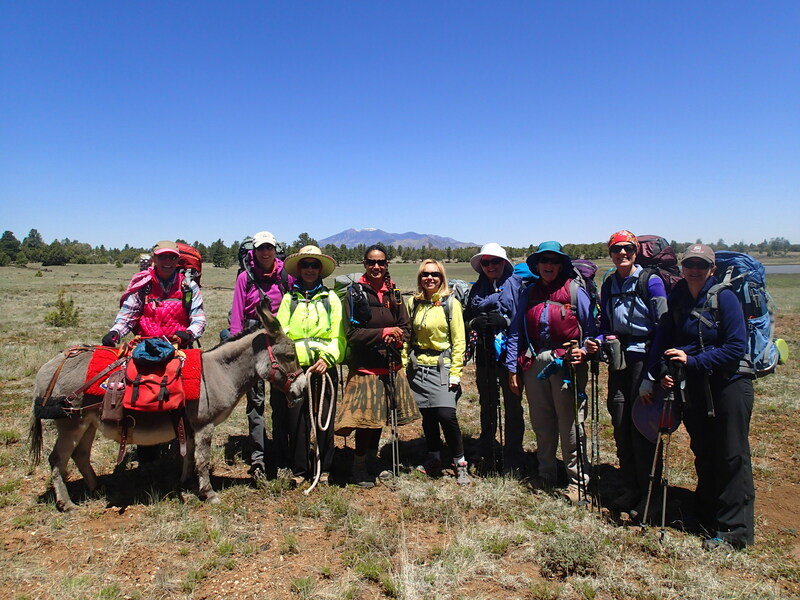 Ten women, one mini-donkey and one therapy dog came from across Arizona—Tucson, Tempe, Sedona and Flagstaff—to join Sirena on a multi-day, 32-mile backpack as she traversed most of Passage 30 (Mormon Lake) and a portion of Passage 31 (Walnut Canyon), leading her ever closer to Flagstaff on her Arizona Trail Trek thru-hike. We came singly, or in pairs; some to support Sirena and promote the trail, some because of a prior professional connection and ongoing passion for the trail, some under the guise of a Mother’s Day retreat, and others to test their gear and skills in preparation for thru-hikes of their own, on the AZT and PCT (Pacific Crest Trail). 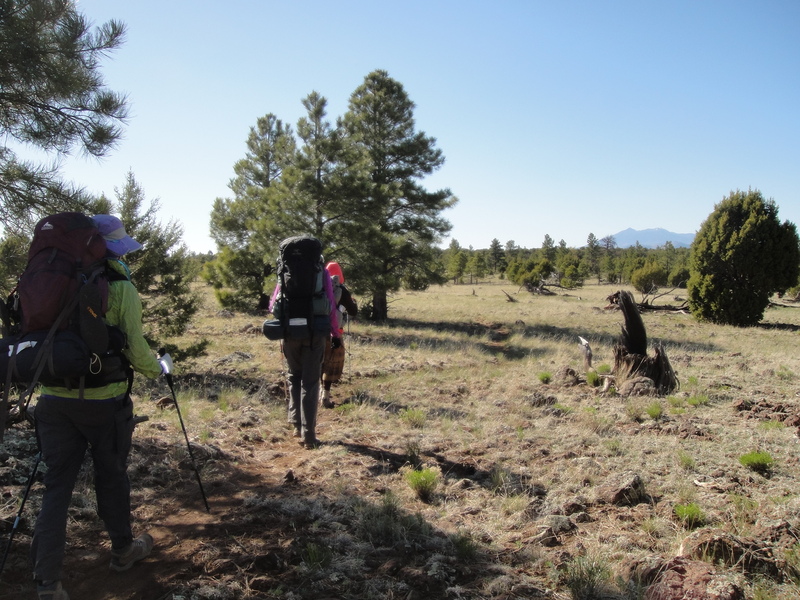 All of us came to hike hard, camp under the stars, and create a shared experience on a beautiful high elevation, ponderosa, pinon and juniper lined stretch of Arizona’s National Scenic Trail. 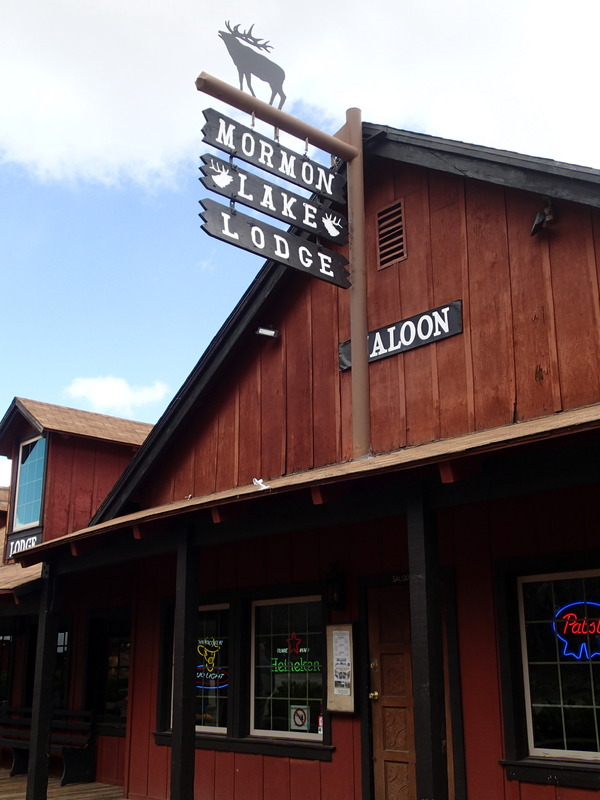 We gathered at the end point (Sandy’s Canyon trailhead) and were shuttled to the start point at Mormon Lake Lodge by volunteers including Jim and Carol McFadden and Sirena’s dad. 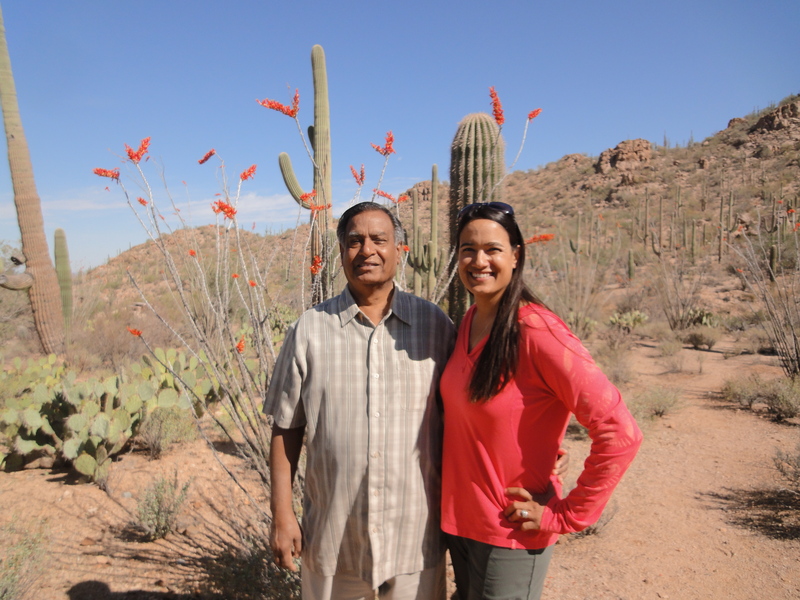 Larry Snead, former Executive Director of the Arizona Trail Association, was there to send us off with good wishes. After brief introductions we were on the trail, eager to get to know one another while logging some miles and trying to keep warm—a front was blowing through and had lowered the expected idyllic high 70s/low 40s to a much crisper high 50s/low 20s, accompanied by a relentless wind. 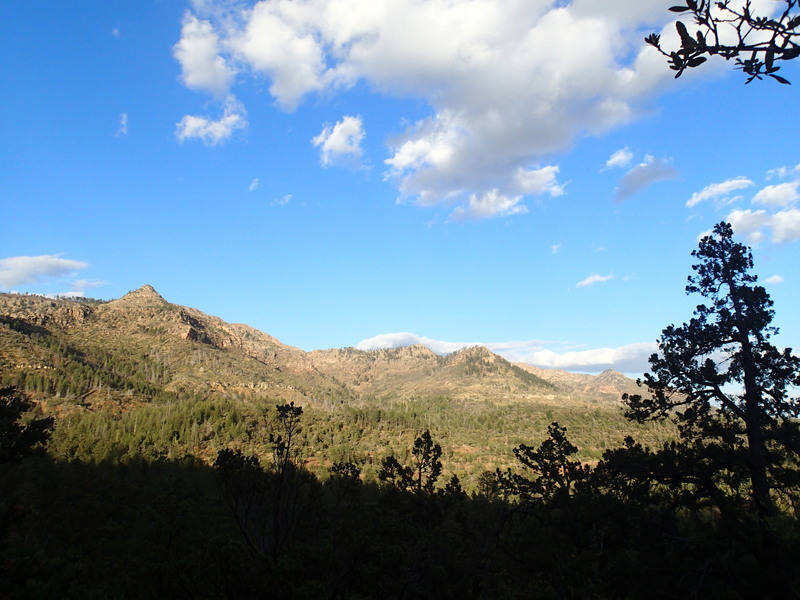 We hiked the short spur from Mormon Lake Lodge that connected us with the AZT. From here we passed our first grove of aspen, snacked at Navajo Spring, and followed an historic railroad bed built for the logging industry in the early twentieth century. 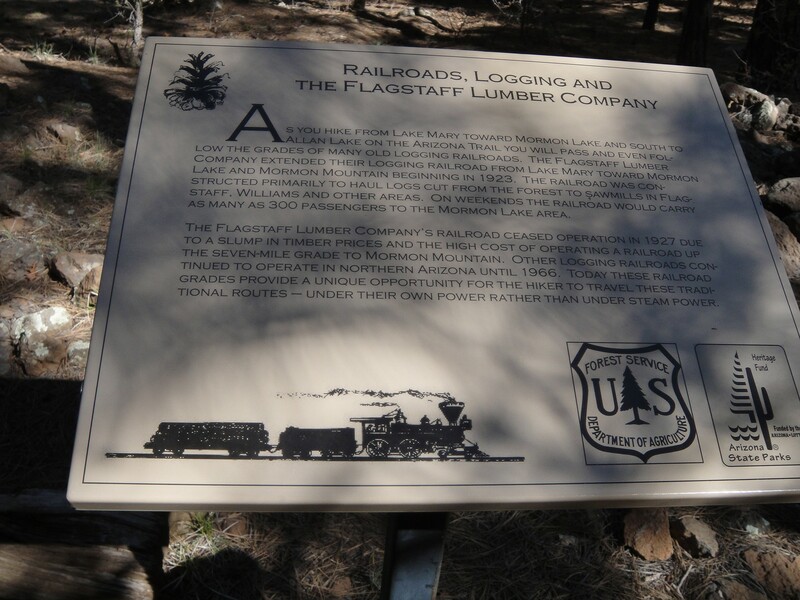 Interpretive signs dotted the trail and added to the experience. 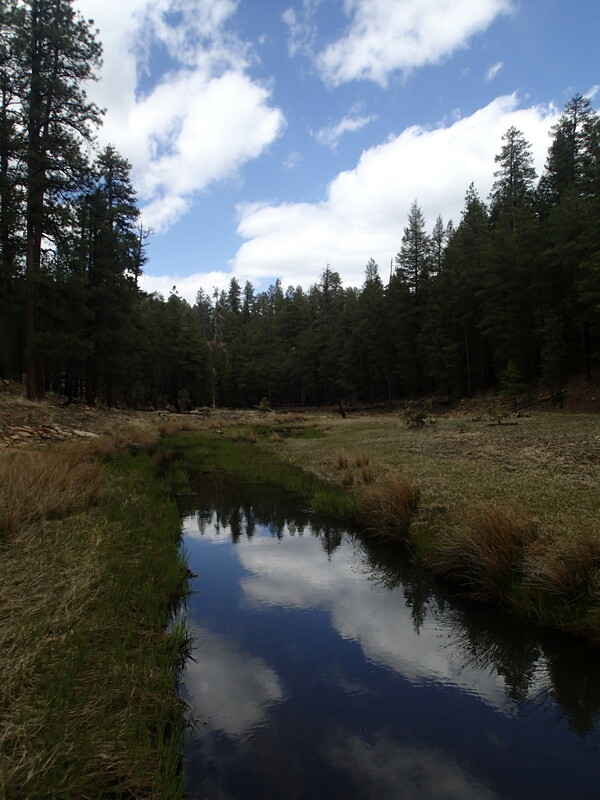 Water was flowing from Wallace Spring as we passed by Double Springs Campground and rejoined the old railroad bed through a canopy of ponderosa pines. 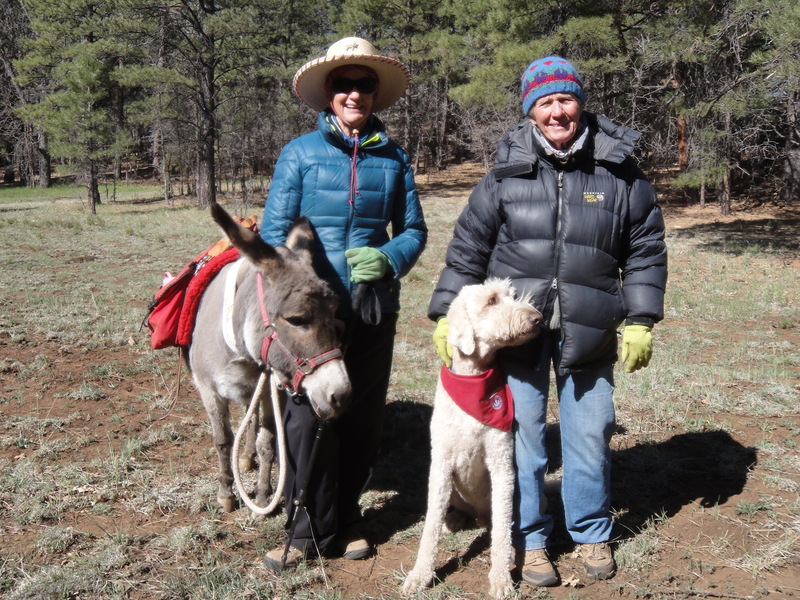 We knew the first day’s hiking was nearing its end when Leigh Anne & Jasmine and Bonnie & Dr. Otis greeted us on the trail for the hike into our first camp near Lake Mary Road. What a welcome treat to be joined by these AZT legends! We awoke the next morning to Jasmine’s braying and fresh coffee “in bed.” How did we get so lucky?! 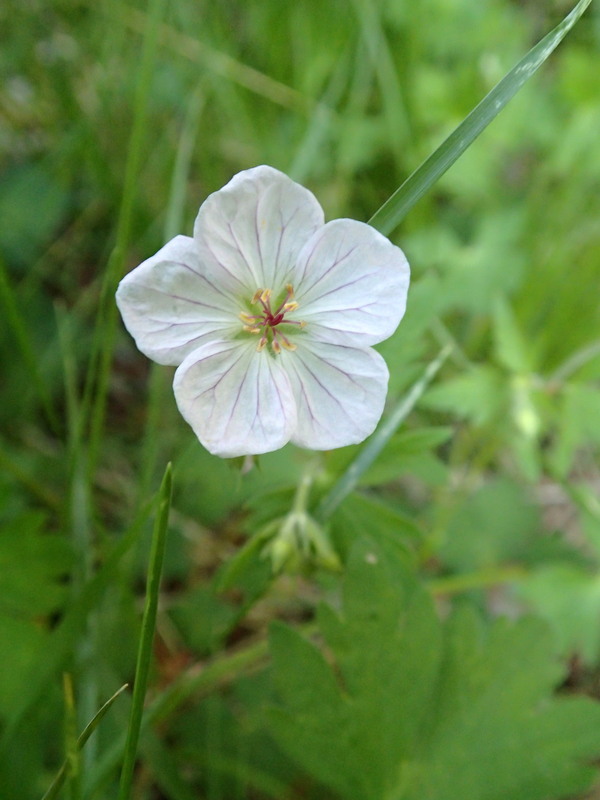 On day 2, the trail continued to follow the historic railroad grade. 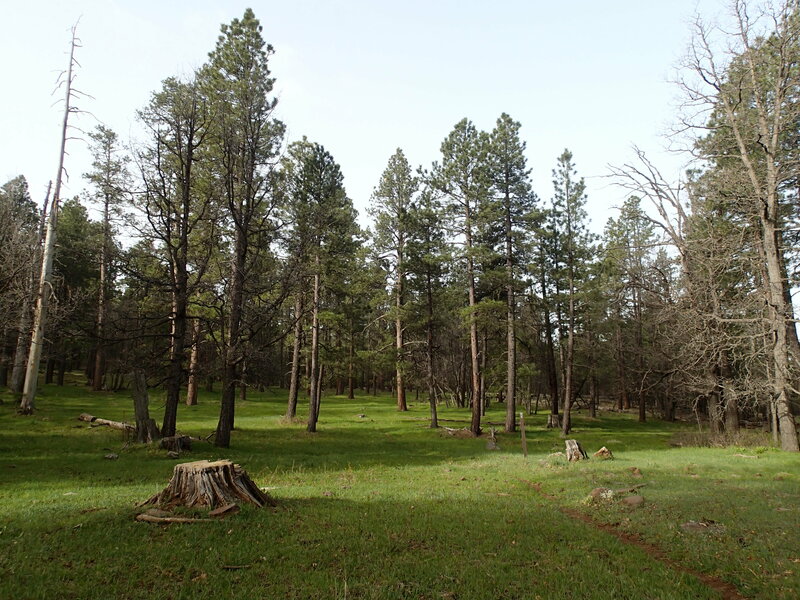 As we headed north, the tree canopy began to thin and we made the short climb up onto the lava flow that mantles Anderson Mesa. 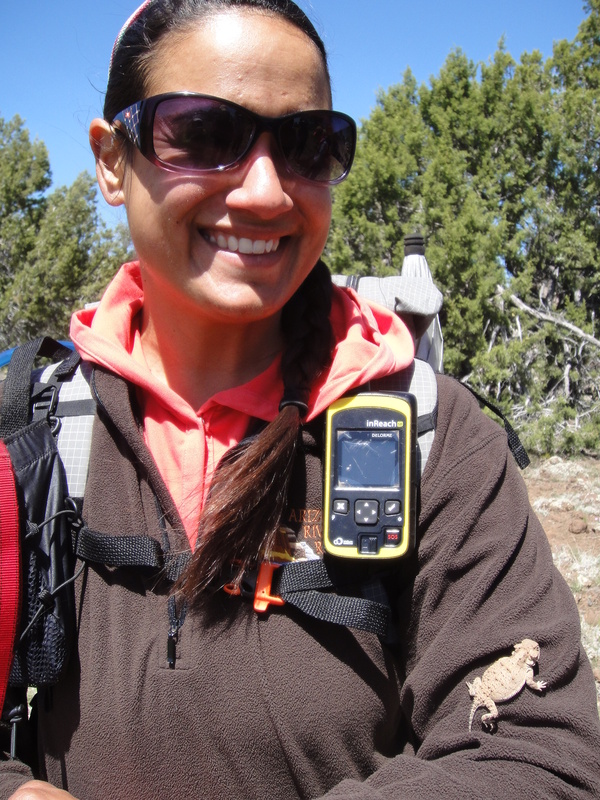 We passed a very chilly black-necked gartersnake and found a wind-blown, handwritten “trail ‘hello! 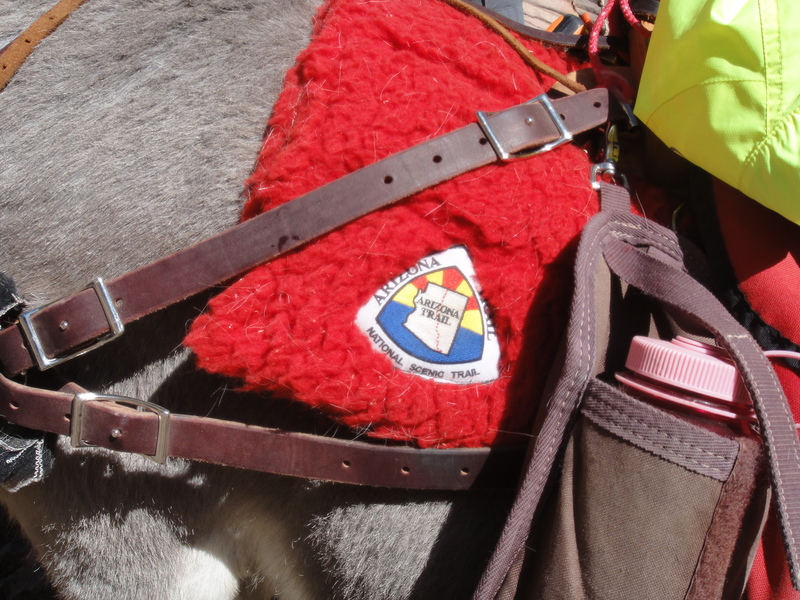 '” note that was possibly intended for cowboy Terry, before stopping for lunch near the Horse Lake trailhead, where we left our four-legged friends and their handlers for the trek across the basalt (but not until after they’d filled us up with water that we hadn’t had to carry, cookies, and kettle corn!). Into the wind and along the road we continued, past Horse Lake, until we could no longer take the biting wind. We found a somewhat protected spot tucked amongst the junipers where we soaked up the last rays of the sun, watched the full moon rise, and sheltered for the night. 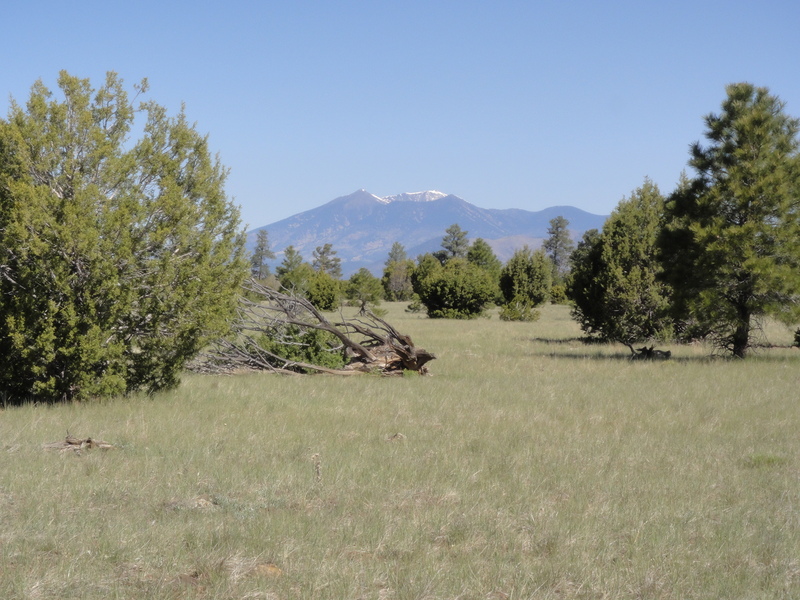 The next day we were treated to repeated stellar, sweeping views of the San Francisco Peaks looming ever closer in front of us as we continued our trek through the pinon and juniper woodland of Anderson Mesa, past Vail Lake. We were also afforded lovely views of Upper Lake Mary and Mormon Mountain before turning north towards Prime Lake, and on to our lunch spot near Lowell Observatory, where we were reunited with Jasmine and Otis and the gang, who once again refilled us with water, cookies and companionship. One cow elk was spotted, and Sirena had several close encounters with horned lizards as we hiked past dry Marshall Lake. 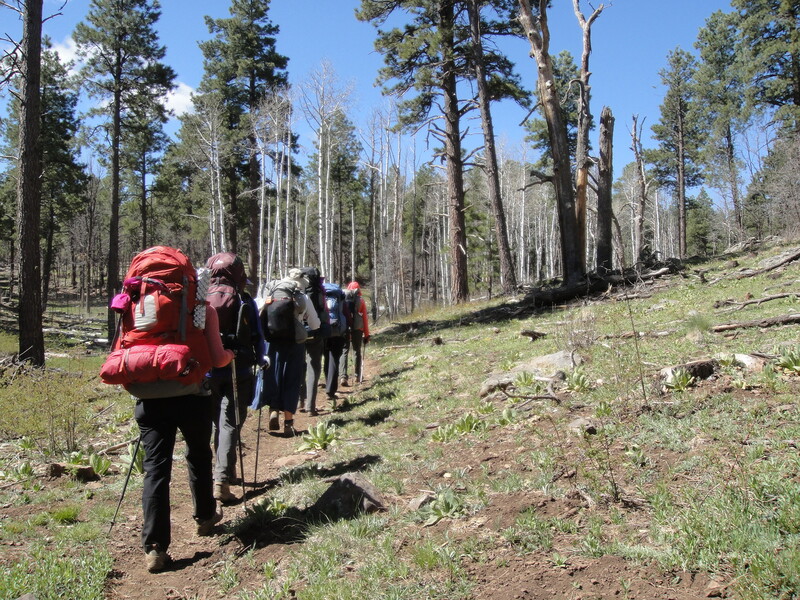 Continuing north, we began slowly descending through Kaibab Limestone and Coconino Sandstone, and through very recently burned areas, the result of April’s Fisher Fire. 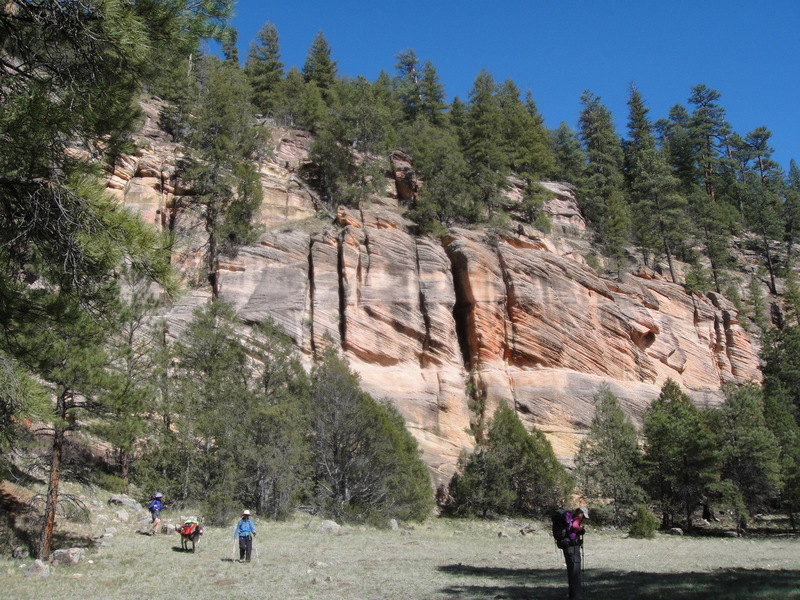 Finally, we descended a few switchbacks into Walnut Canyon where we were awed by cross-bedded sandstone cliffs basked in an orange sunset glow. We spent a long while inhaling the panorama, avoiding what we knew was coming for all but Sirena—the end of our backpacking escape. 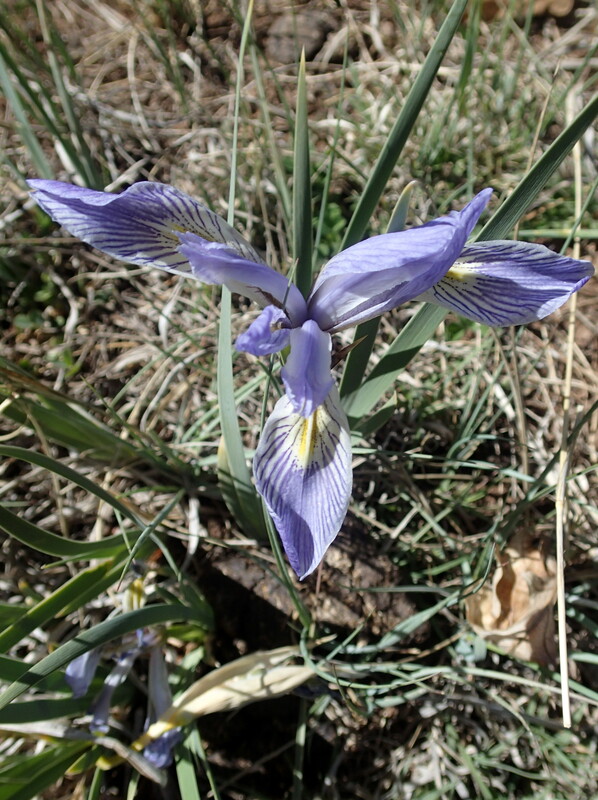 A short hike up and out of Walnut Canyon, past early blooming irises, brought us to our waiting cars and inevitable goodbye-for-nows. 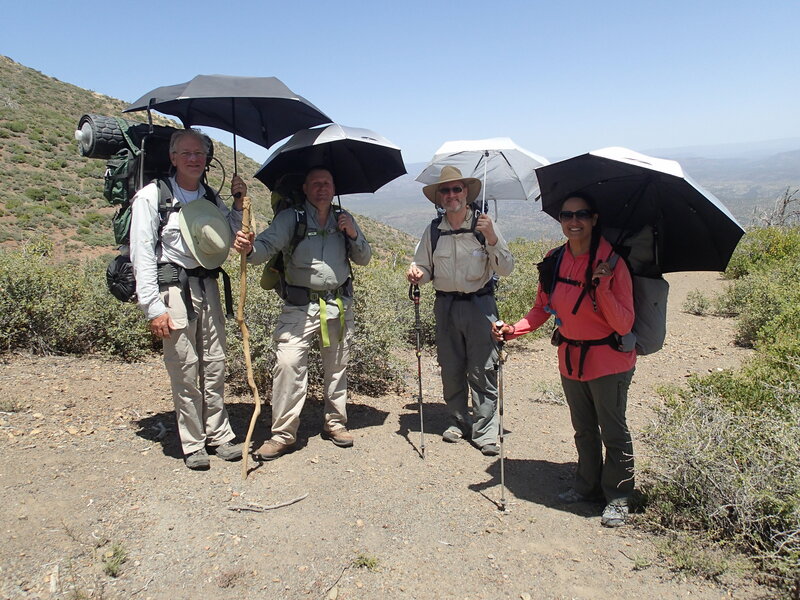 All of us were grateful for the support afforded us on this trek by co-hikers and volunteers, and envious of Sirena as she continued northwards without us. 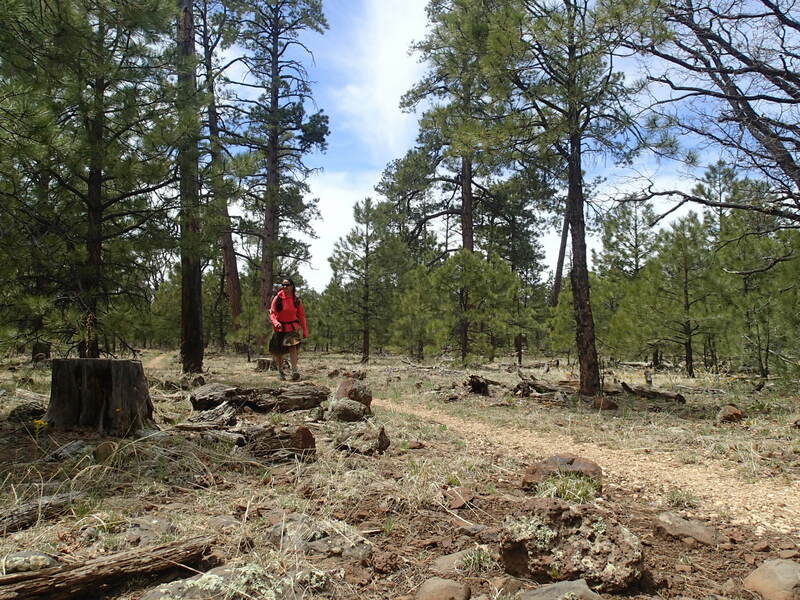 Just a reminder- the campaign to raise $20,000 for the Arizona National Scenic Trail will stay open until the end of June- already over $18,000 has been raised! 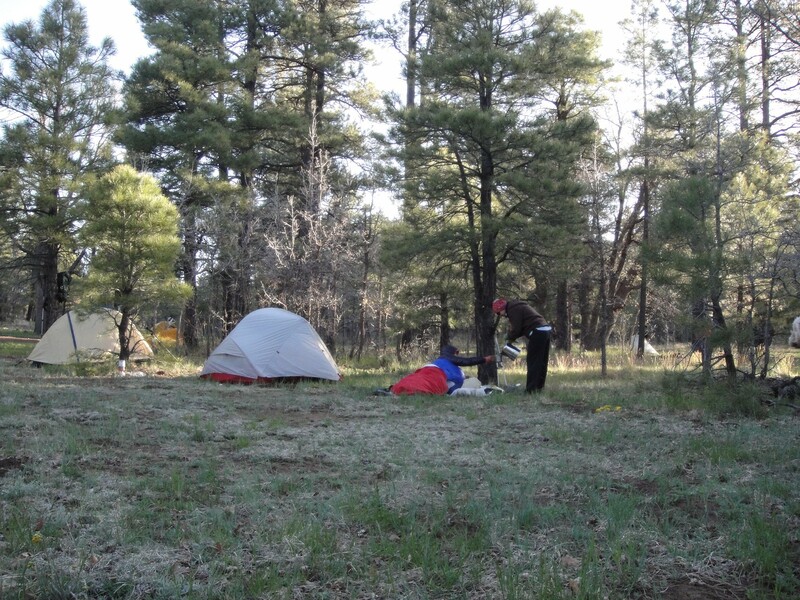 Donate now, and consider becoming a member of the Arizona Trail Association. Jasmine represents, and you can, too! 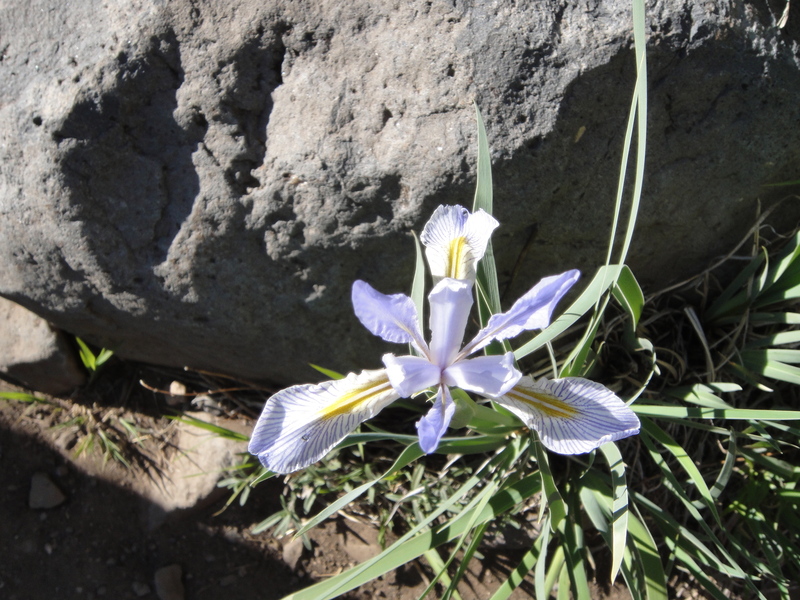 After I had a day to recover from my Very Bad Day on the Highline Trail, I was ready to keep hiking. But as I was getting ready to leave, I got a call that a news station in Phoenix wanted to do an interview with me. After some technical difficulties, I got the interview done around 10:30. I decided to dayhike southbound so that I could still get my miles in. My neck and back were still pretty sore from hitting my head on the Highline Trail. My dad, support crew extraordinaire, dropped me off on the Blue Ridge passage. Happy to be in the cool pines! 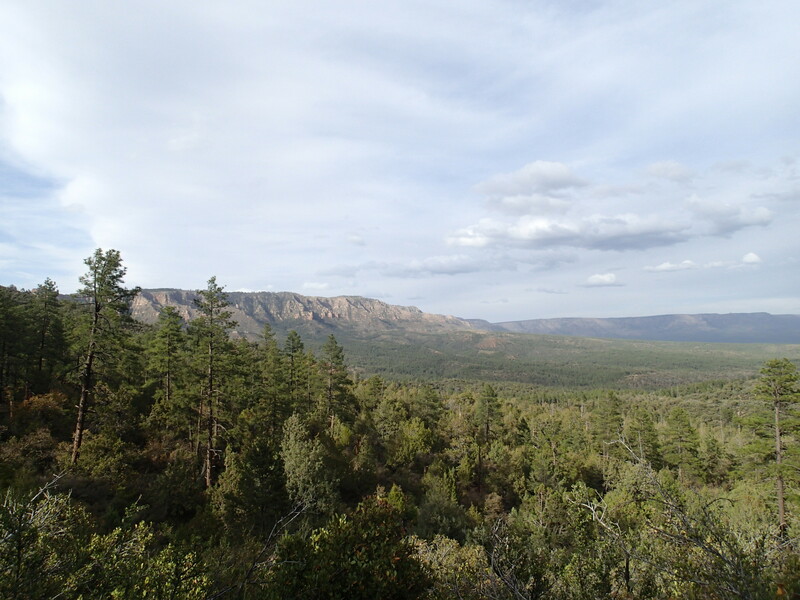 This area marks a stark transition from the rugged deserts and mountains of Southern Arizona for one big reason- the Mogollon Rim. The Rim is an escarpment of cliffs that marks the edge of the Colorado Plateau. 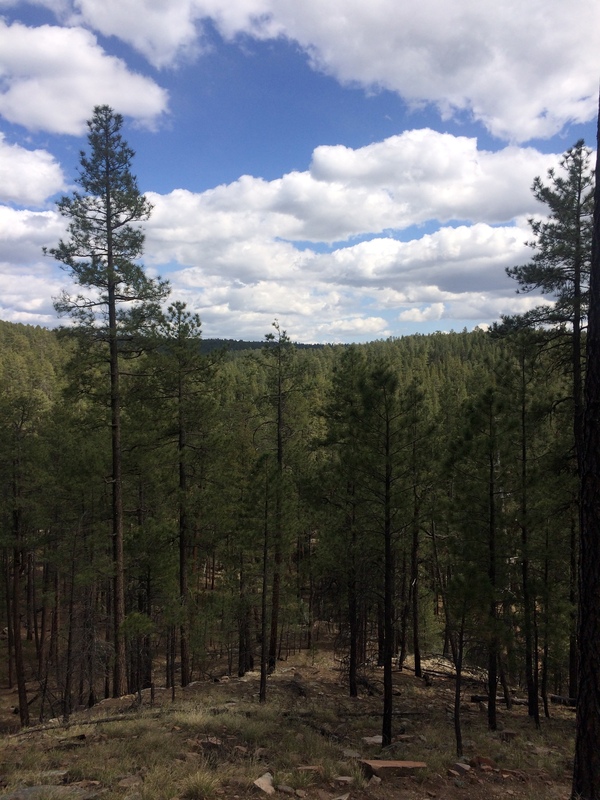 Once you are on top of the Mogollon Rim, all of a sudden you’re in the largest Ponderosa Pine forest in the world! 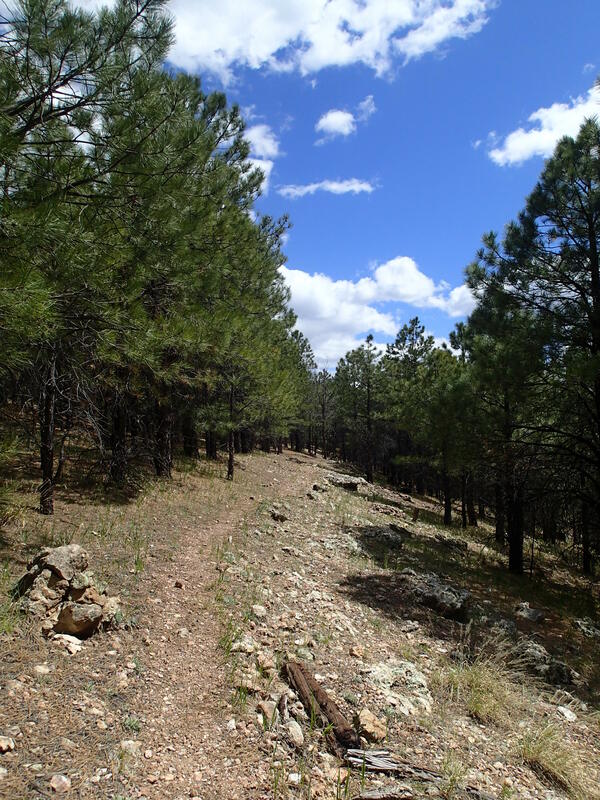 The trail is at 7000 feet elevation, the weather is cool, and the walking flat and easy. It’s like a whole different trail. I descended to the East Clear Creek crossing, only there was sadly no water to cross. All thoughts I’d had of taking a nice break near the creek vanished and I hiked on. 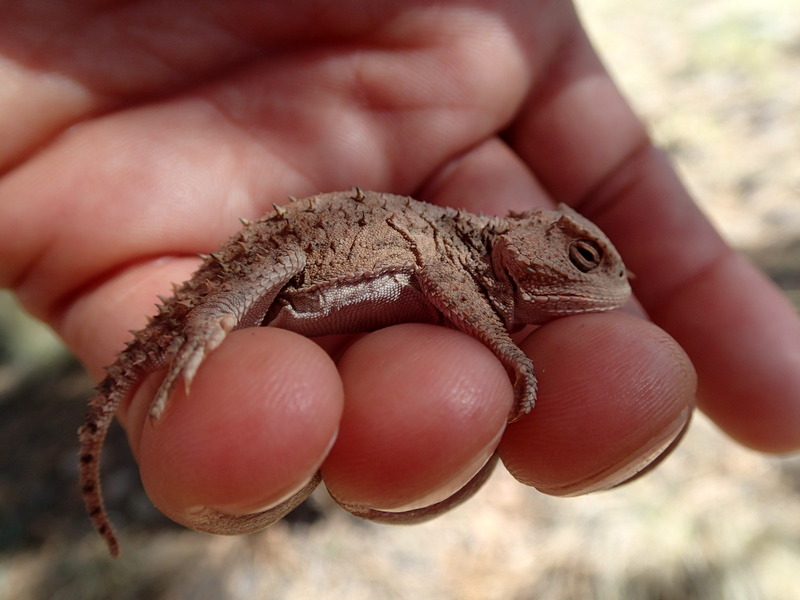 I spent some time catching a horned lizard, one of my favorite trail activities. 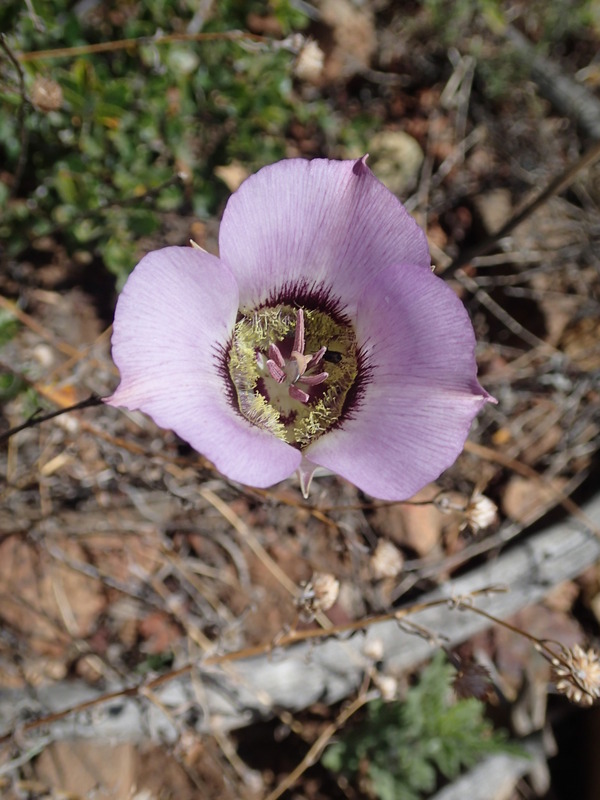 The trail meandered among the pines and then came to the highlight of the passage: hiking in General Springs Canyon. What a beautiful piece of trail, next to a running creek on a perfect day with big fluffy clouds in the sky. I had to take a break to dunk my feet. My body has been holding up well on this hike, except for my middle toe on my right foot. It started hurting a week or so ago and now won’t stop. I keep it ensconced in a wrapping of Band-Aid Blister Bandages to cushion it. 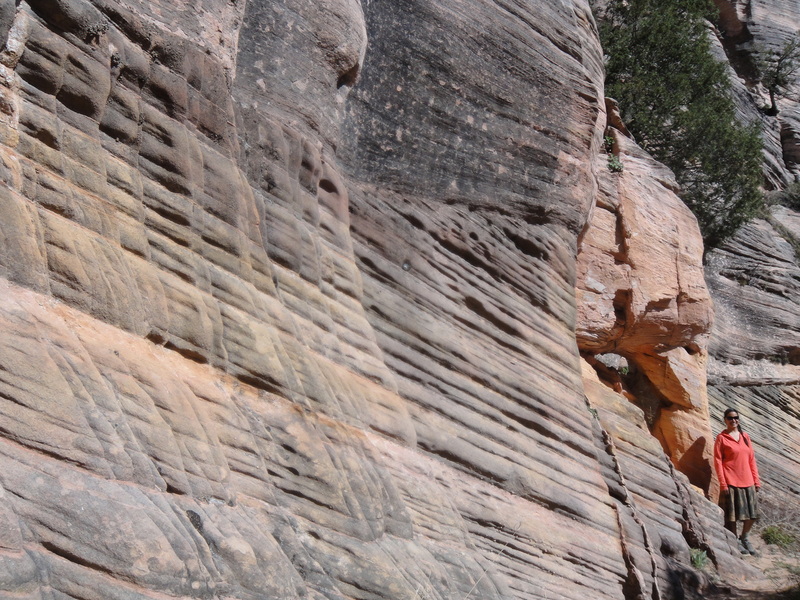 I hurt it during river season last year and the endless rocks of Arizona have given it quite a pounding. After my creekside break, the trail followed along the stream until it reached General Springs Cabin, built in 1918 as a fire station. 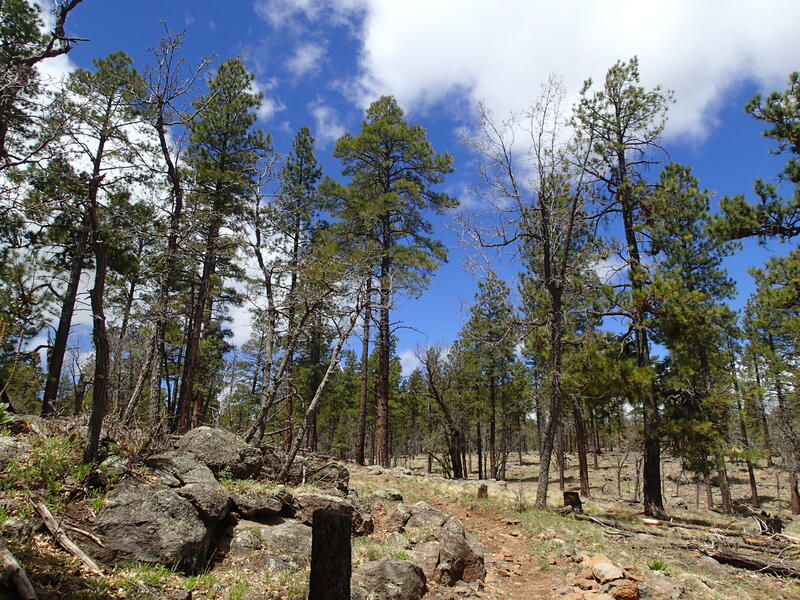 I hiked toward FR 300, which runs along the edge of the Mogollon Rim. 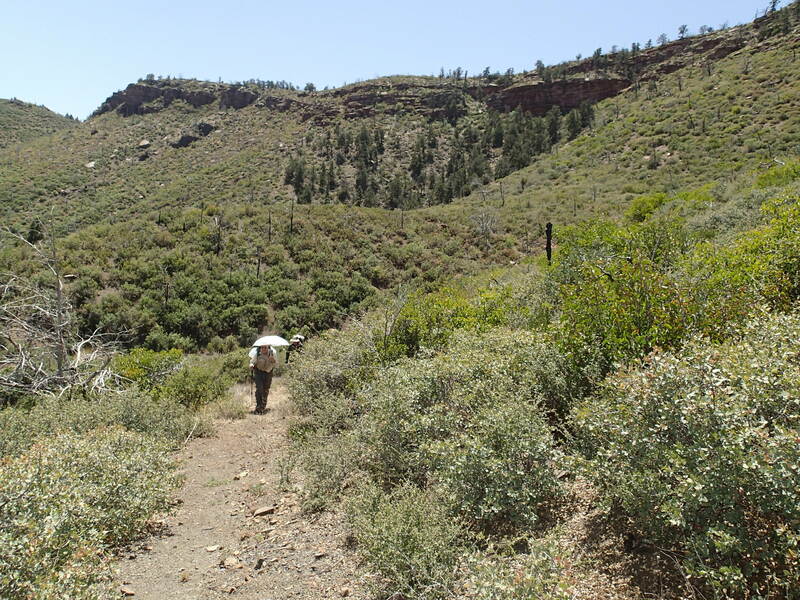 The trail descended steeply and then crossed the East Verde River, the same river I’d played in near the LF Ranch in the Mazatzals. The running creek was too good to resist, so I dunked my feet again and enjoyed the sound of rushing water and birdsong. I reached Washington Park and my dad right as it was getting dark, he had just seen a bear cross the road nearby. We went back for one last night in Pine. The next day, I didn’t get on the trail until 11:30, I had a bunch of emails and planning for the next segments to do. My dad dropped me off where I left off so that I could backpack for the next three days to Mormon Lake. I had a small piece of the Blue Ridge passage left before crossing Highway 87. It was a gorgeous day, the weather was fantastic and after a while I realized that I could hike in a skirt instead of pants. I stopped to change and eat a snack and continued hiking. After a while, I came to a road crossing and trailhead that looked way too familiar. How could it be- I ended up back at the trailhead I’d been dropped off an hour before!! I had gotten turned around after my break and I walked right back the way I came! Since the sun was overhead and the pine forest looks all the same, I hadn’t realized my mistake. Feeling sheepish, I turned myself around again and hiked the next half-hour of trail for the third time. Finally I crossed 87 and the trail continued on singletrack toward Jack’s Canyon. I reached the 500-mile mark of the trip and had a little celebration. 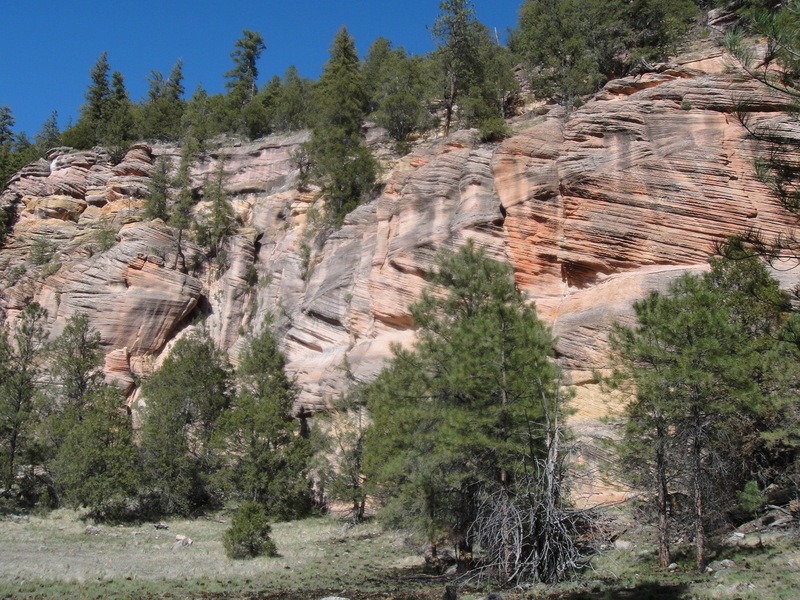 The trail through Jack’s Canyon was pleasant, winding along the canyon bottom. Took a break to enjoy some strawberry jalapeno goat cheese and crackers and goat milk fudge from Fossil Creek Creamery- yum!! The singletrack ended and I hiked along a series of two-track roads for the rest of the day. My right foot was really sore, sometimes sending shooting pains up my middle toe if I stepped on it wrong. The rocky roads didn’t help matters any. 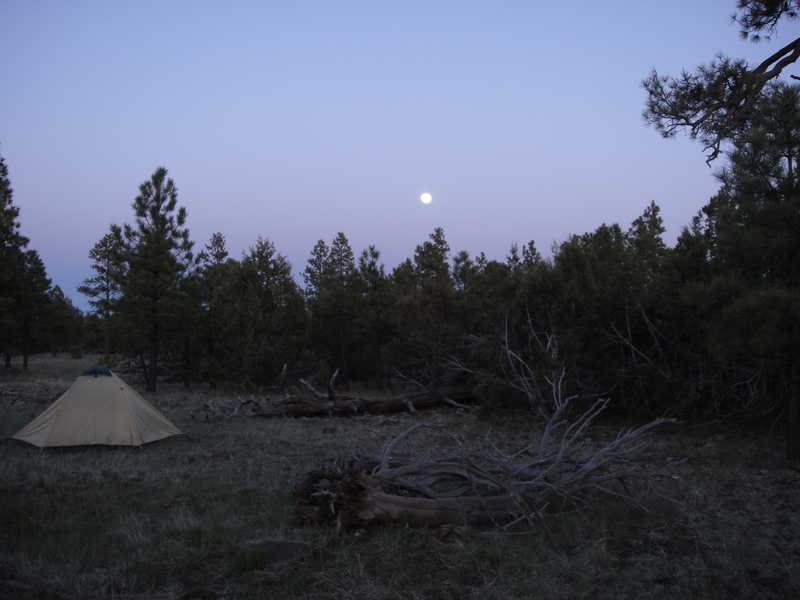 I found a spot to camp among the pines with soft needles covering the rocky ground. The next day was spent traveling a series of two-tracks. I thought I’d see people out for the weekend but maybe they were kept away by the cold, incessant wind. 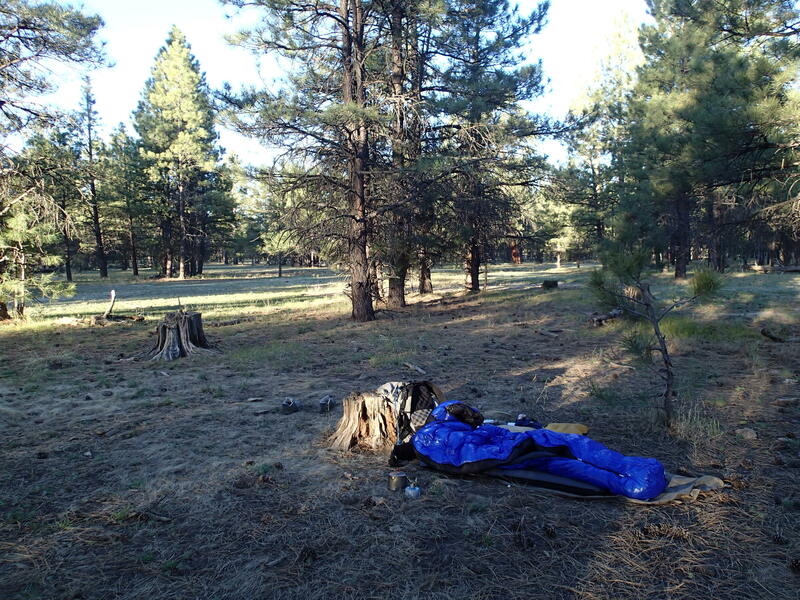 Only saw two guys camped near Bargaman Park. Stopped to talk to them and they filled up my water bottles and gave me a cold pineapple juice. I saw many groups of elk and lots of birds, often when I would approach one of the water sources. One red-tailed hawk sat in a tree, screaming over and over again to others in the area. I hiked until it got too dark to see the trail and set up camp. My feet were killing me, having been relentlessly pounded by the rocky ground. Made dinner and called my dad, who suggested he meet me tomorrow morning and take my pack so that I could carry minimal weight for the final 9 miles into Mormon Lake. The next morning it was cold with a biting wind and overcast. The remaining miles to the end of the passage were pleasant singletrack through bright green grasses. My dad met me at the trailhead with a second breakfast and a coffee- yay! I offloaded some of my stuff and continued on to Mormon Lake. Thanks Dad!! I crossed Lake Mary Road and made my way along the windblown trail. I was all layered up and still chilly while hiking! 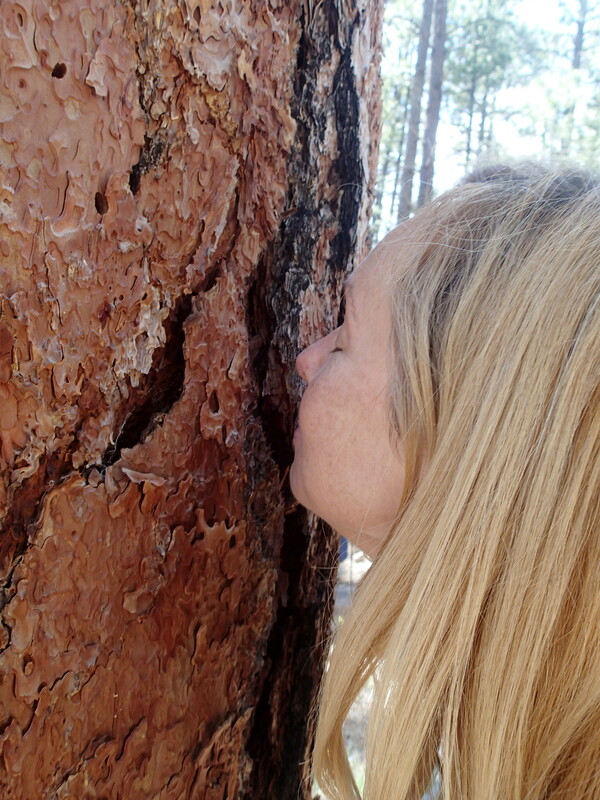 The trail wound through the ponderosa pines and soon I was at the junction for Mormon Lake Lodge. Hiked down the mile-long access trail to meet my dad at the lodge and say hi to Larry Snead, former director of the Arizona Trail Association. It was snowing! 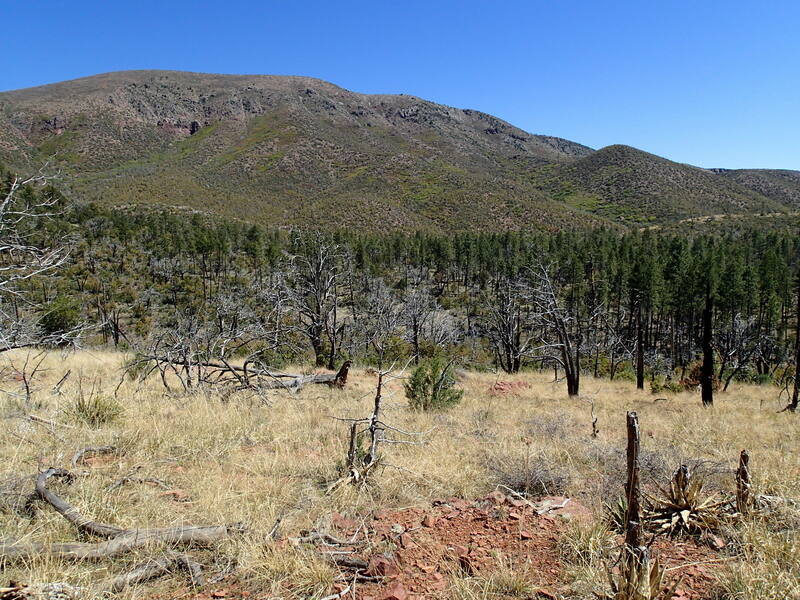 Just flurries, but remember just over a week ago I’d been overheating hiking out of the East Verde River valley. My dad groaned about the weather, he lives in the Chicago area and they’d had the worst winter ever and now here he was, back in the cold again! It was always such a treat to see my dad at the end of a day of hiking. He would drop me off, then go on his own adventures exploring the area, then we’d get together and share stories and pictures. He’s definitely where I got my sense of adventure from. So glad he has been such a big part of the hike, he’s the best support crew ever! He came out and helped me a lot when I was section-hiking the trail in 2008-09 and it’s so much fun to be able to do it all over again. It’s been almost 20 years since I moved away from the Chicago suburbs, so to spend this much time with my dad is definitely something I’ll cherish about this journey. My dad and I went into Flagstaff for the night to warm up and got dinner from my favorite- Pato Thai- and checked into a hotel with a hot tub. It was just what I needed for my windswept, chilly, footsore self. 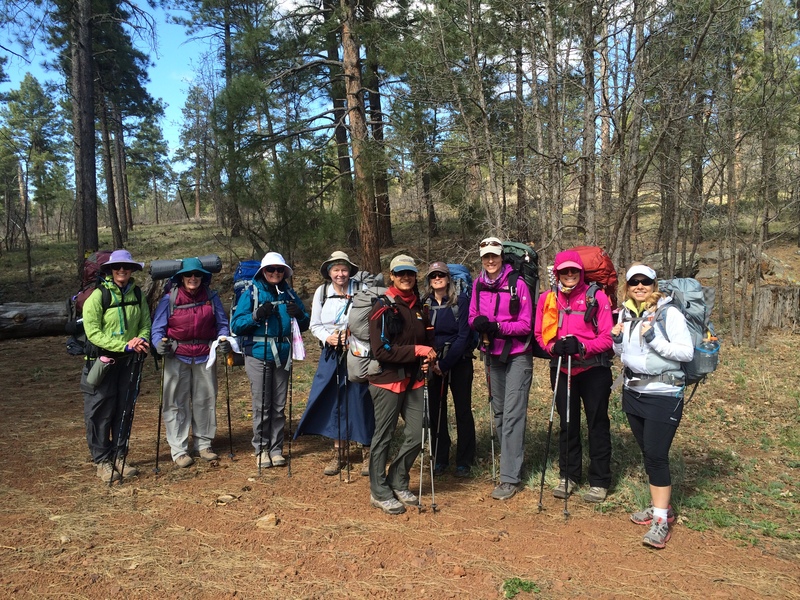 Up next: a guest blog about the Women’s Backpacking Trip! 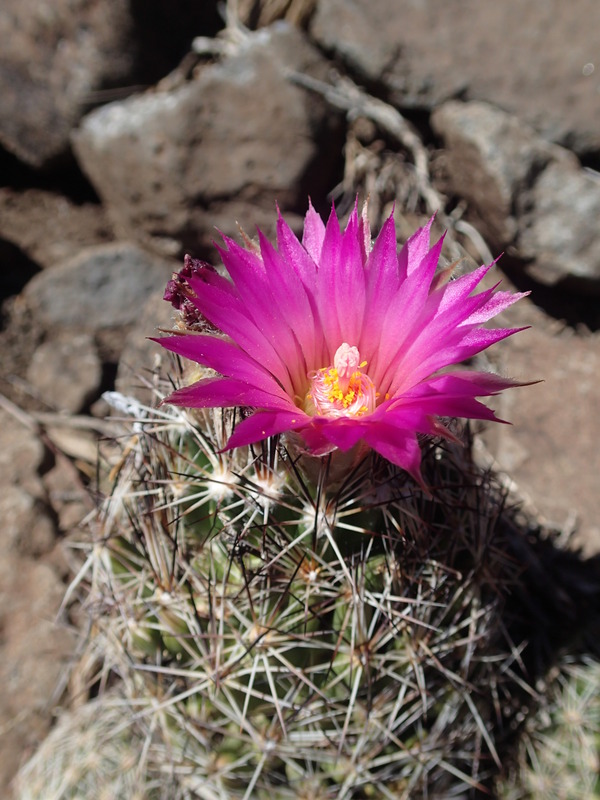 I am keeping the fundraiser for the Arizona Trail Association open until the end of June- to date $17,800 has been raised! Click here to donate and help us reach $20,000! 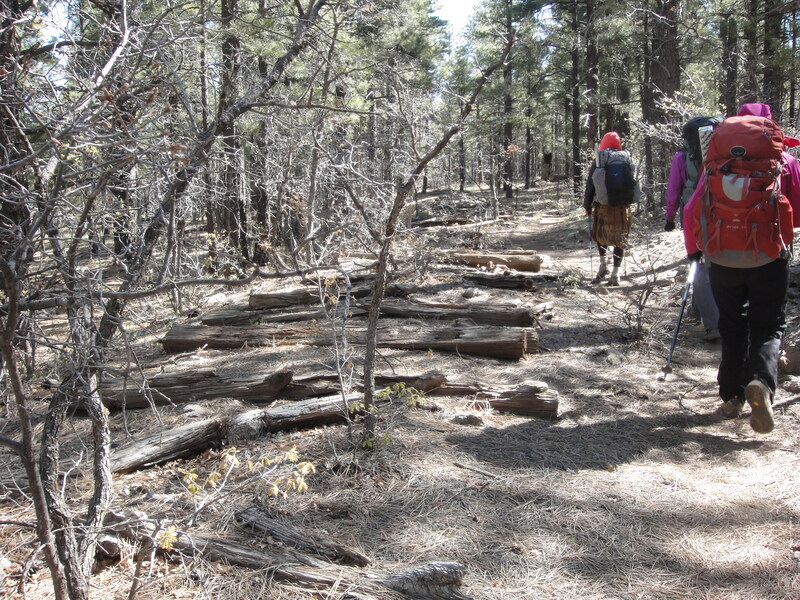 Hiking into Pine is a special moment for any thru-hiker on the Arizona Trail. The mountains have been rugged, the footing rough, and after 400 miles on the trail, it’s time for a break! 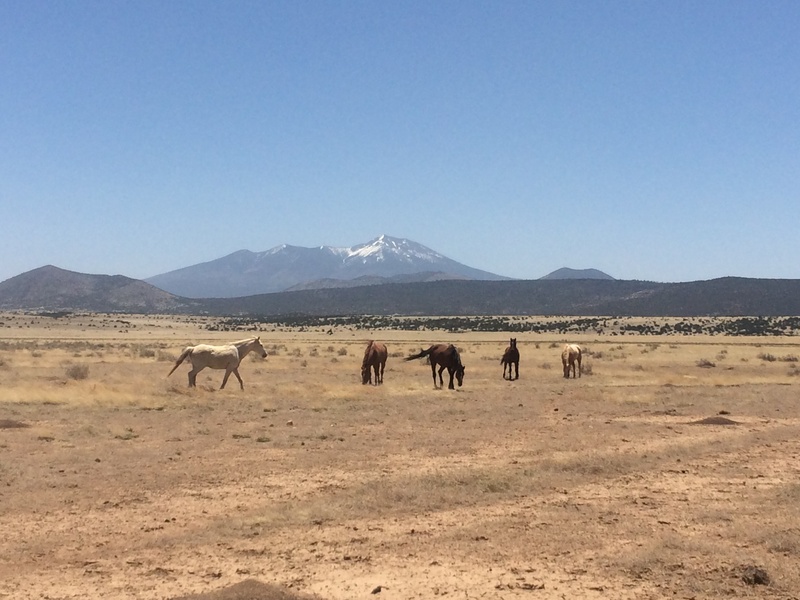 And Pine/Strawberry is the perfect Gateway Community for it- the locals have really embraced the Arizona Trail and all the hikers, bikers, and equestrians it brings to their small mountain towns. I had a Gateway Community event on the night of the 3rd, but first I had to hike the remaining 12 miles into Pine. My dad and I went out for breakfast, and as I was leaving…I twisted my ankle!! Not on some remote, rocky trail- but in town! It didn’t feel too bad at the time, so I continued with my hike as scheduled. The event at That Brewery (brewers of Arizona Trail Ale!) 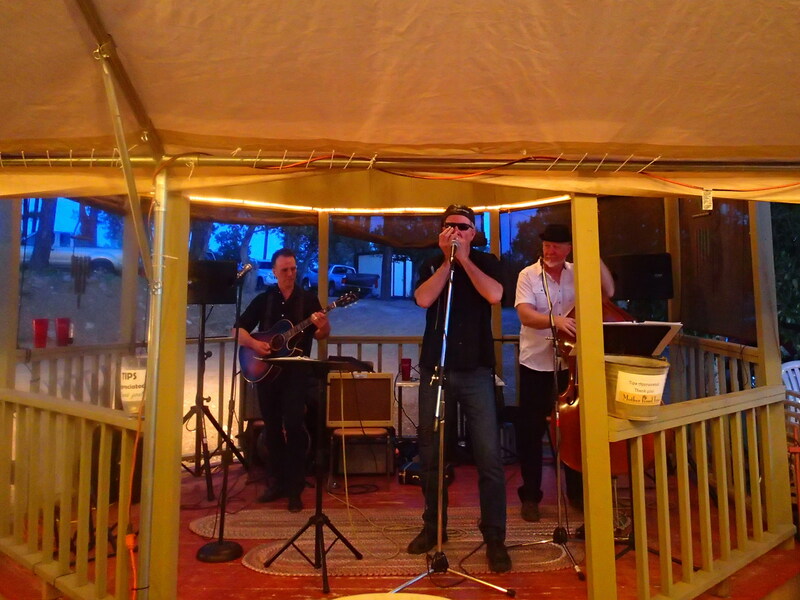 was so much fun, the weather was perfect and the Mother Road Trio from Flagstaff provided the entertainment. All sorts of folks came up to me, asking how my ankle was doing. News travels fast in a small town. 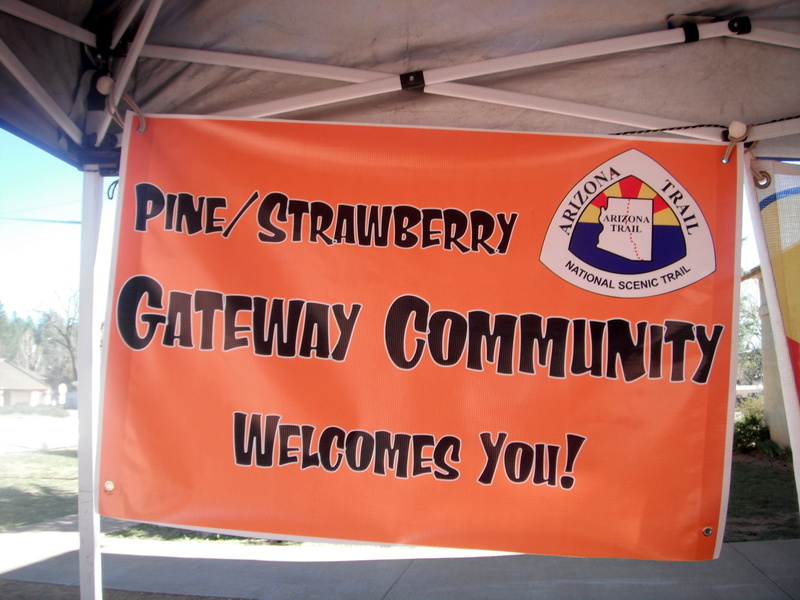 The next day was the third annual Pine Strawberry Trails Day– a full day of hikes, demonstrations, trailwork and activities! 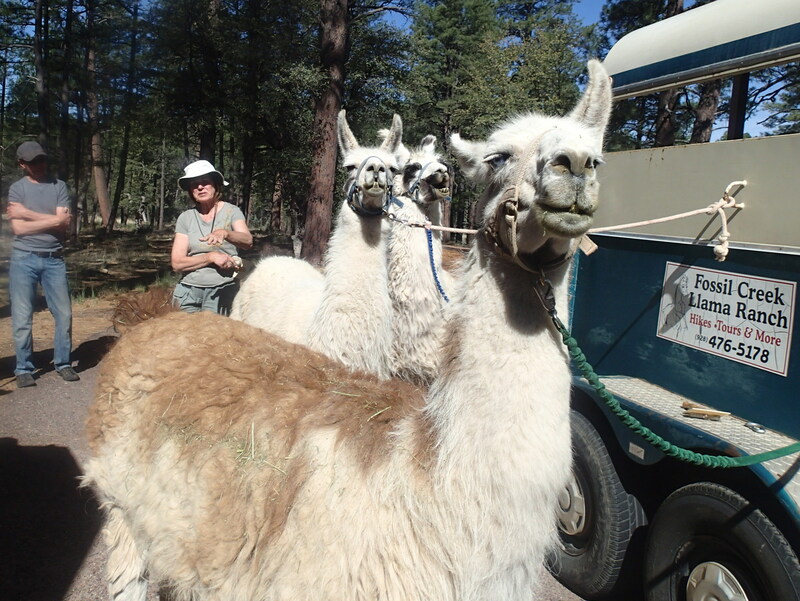 I tagged along for the Llama hike with Joyce Bittner and her llamas from Fossil Creek Creamery. The next day was a much-needed day off, only a big chunk of the day was taken up by interviews and planning for the next leg of the hike. See the interview I did in Pine here. I was able to get an amazing massage from Vivian Seville and visit with my husband who came up to see me. 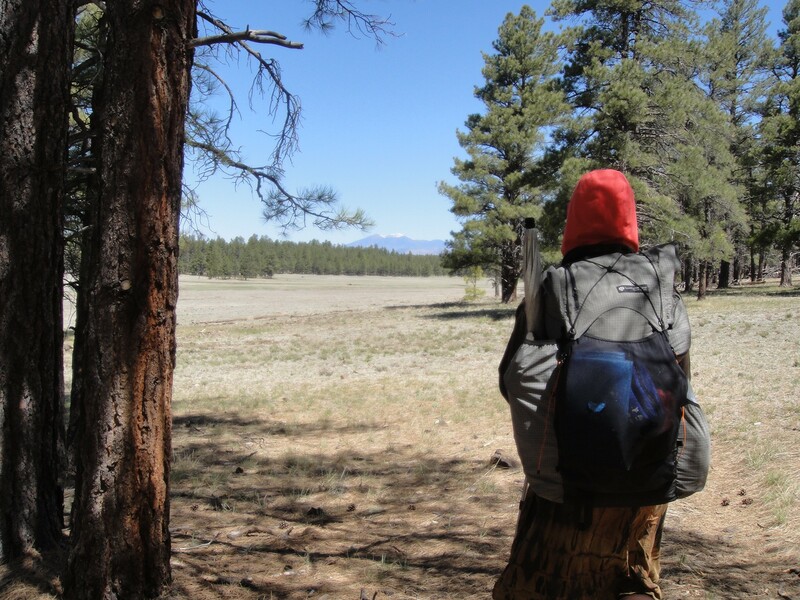 The next morning my dad dropped me off at Washington Park so that I could hike the 17 miles back into Pine. 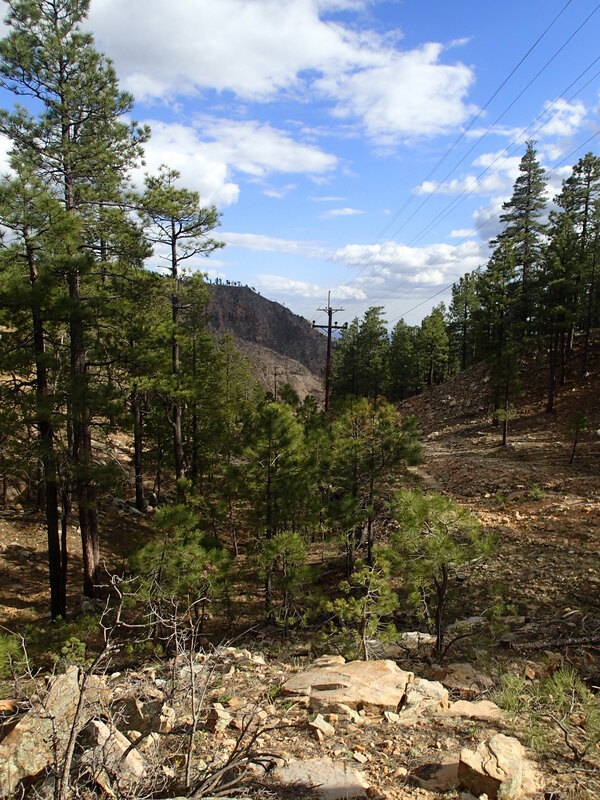 I was on the Highline Trail, an old route taken by the families who settled here underneath the Mogollon Rim many years ago. 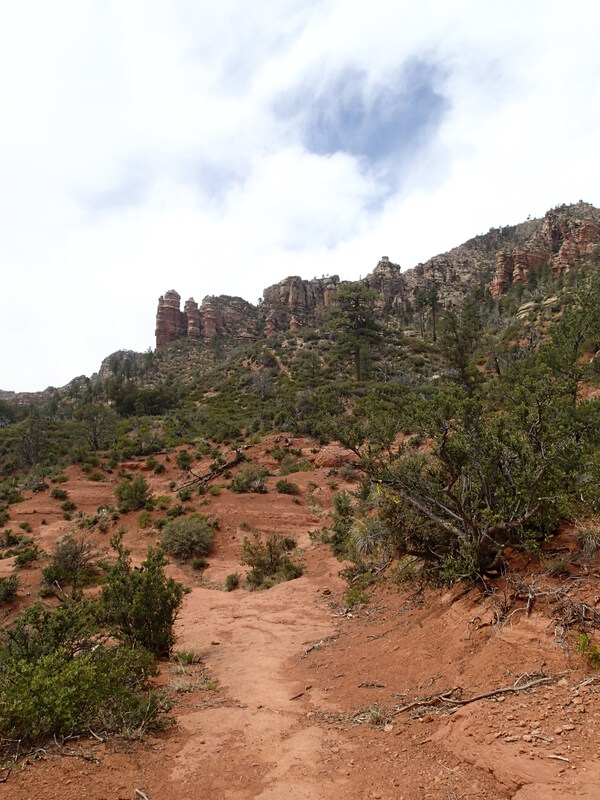 There are parts of it that remind me of Sedona- exposed expanses of red rock. So now I’m whipping my head around like some crazy woman, hoping no one comes by because I’m in my bra, but also hoping that someone comes by and helps me get this fricking bee out of my hair! While I was trying to get the bee out, another bee bumped me in the chin. This is not a good sign, it means that they are trying to get me out of their territory and that there will be more bees on the way. Finally it gets quiet and I gather my things and run like hell. I get about a quarter-mile away and finally let out a sigh of relief that it is over. 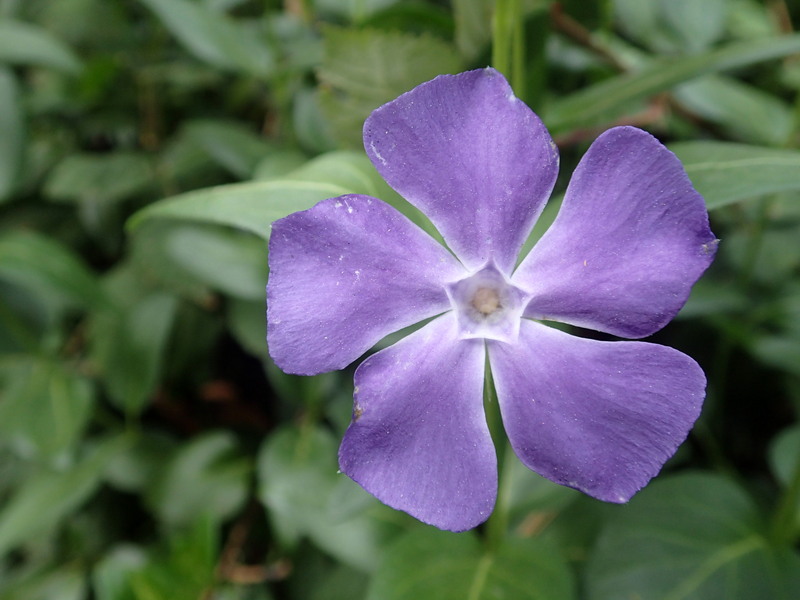 Only it’s not over…”ZZZZ…zzzzzz…zzzzzzzzzzzzzzzz”. The bee was still in my hair! More flailing around, trying to get it out. I took my shirt off and there it was, attached to the shirt, stinger pulled from its body. I brushed it off and ran again. Another quarter-mile away, I put my pack down, ready to take a break after over 15 minutes of terror. And to my horror, I hear “ZZZZZ…zzzzzzzzz…ZZZZZZZZZZZZ!” Are you kidding me? A second bee had been stuck in my hair on top of my head!! One last round of whipping my head around to free the second bee and it was finally over. People often ask me, “Aren’t you scared of all the animals out there?” and truthfully there is nothing that scares me more than the idea of a bee attack. The episode was terrifying, knowing that if there were enough pissed-off bees in the area that I could have been seriously hurt or died. I am so lucky that I escaped without even one sting. I was also glad that I’d added an epi-pen to my first aid kit for my thru-hike. By this time I was exhausted from all the energy I’d spent on the bee encounter, but I still had 12 miles to go. I tried to enjoy the expansive views on the Highline of the Mazatzals and 4 peaks and saw several groups of elk. There are great places to relax by running creeks on the Highline and I met fellow thru-hiker Nate and his dog Bandit at the Geronimo Creek trailhead. I stopped for a while and soaked my feet and told him of my crazy day so far. He told me of a much worse encounter he’d had with bees while climbing that made me realize it could have been much more serious. After a nice break and chat with Nate, I continued on the trail. 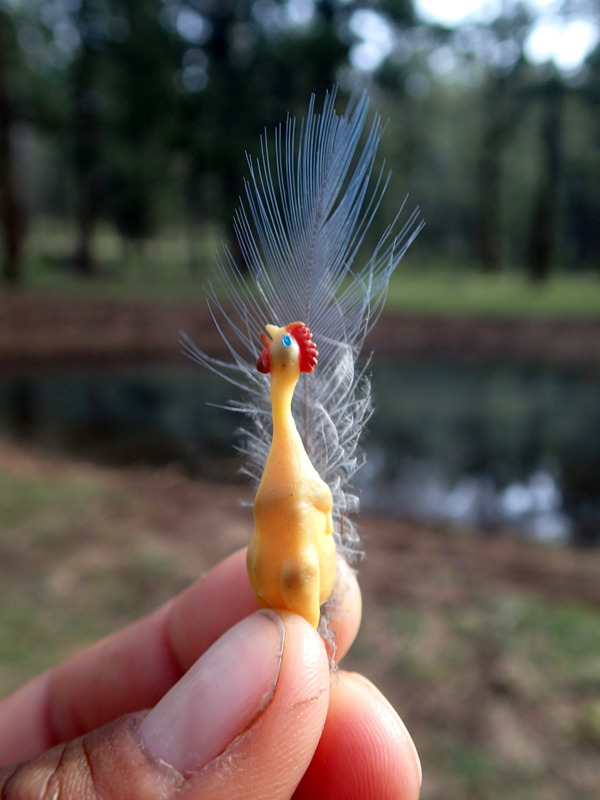 I was hiking along, fiddling with something in my backpack hip pockets when all of a sudden I found myself on the ground, and could feel blood dripping down my scalp. It all happened so fast it took me a minute to realize what had happened. 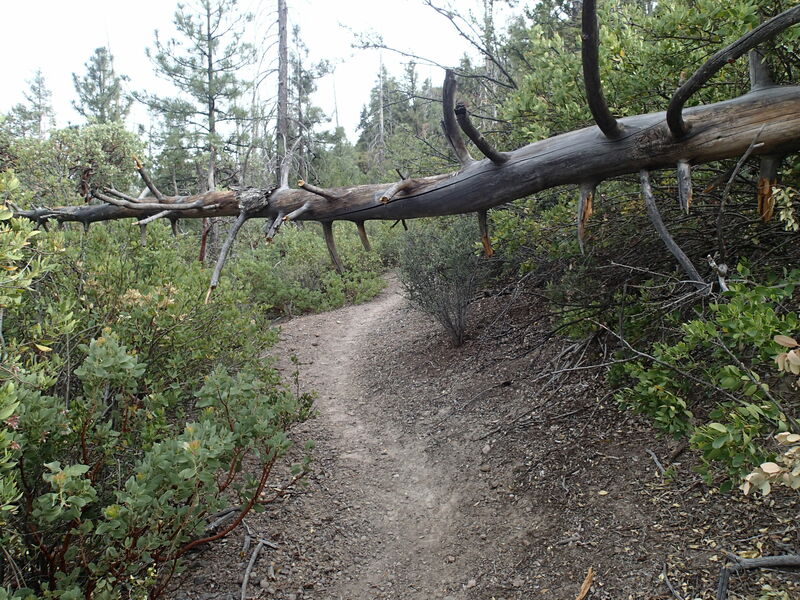 There was a tree down in the trail, head height, with several branches broken off. I had hit the tree with my head and two of the branches cut my scalp. The downed tree- look at those broken branches- ouch!! I got my bandanna out and sure enough, I was bleeding. I reminded myself that scalps bleed a lot and tried to assess the damage by taking head selfies to try and see the cut. Assured that my brain wasn’t coming out my head, I stopped the bleeding with some pressure and took a bit to gather my composure. I sent a text to my dad that I’d hit my head and trudged the remaining five miles to the trailhead. I couldn’t believe the day I’d had- such an emotional rollercoaster! So lucky that I didn’t get stung or knock myself out cold when I hit my head. I was happy to see my dad waiting at the trailhead for me and know that this crazy day was finally over. Thankfully I was able to take the next day off from hiking and rest up. I had given myself whiplash when I hit my head, completely negating the wonderful massage I’d had before the hike. I did venture out to Fossil Creek Creamery to feed the baby goats and got sent away with some delicious goat milk fudge and goat cheese for my travels. I will continue to fill in the entries I didn’t have time for during the hike and I’m also keeping the fundraising campaign open until the end of June. 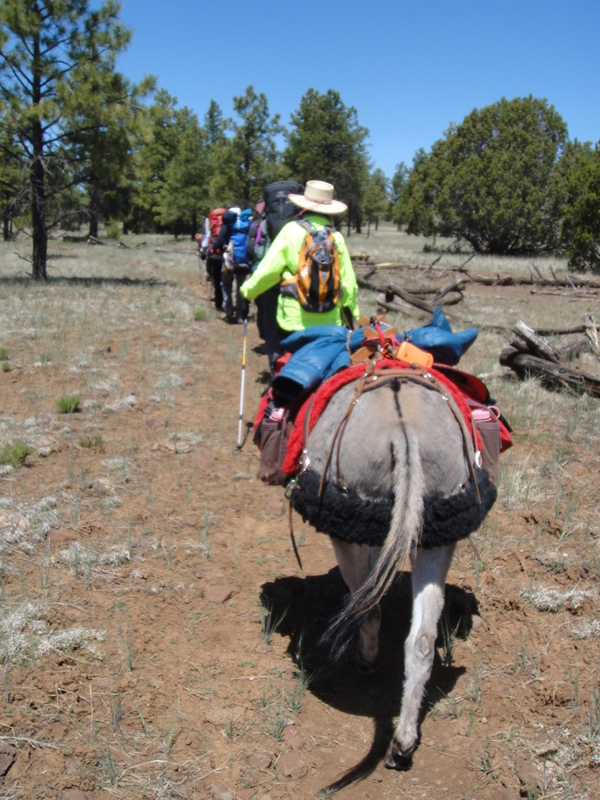 To date, the Arizona Trail Trek has raised $17,800 toward the goal of $20,000 for the Arizona Trail Association- Click here to go to the donate page! 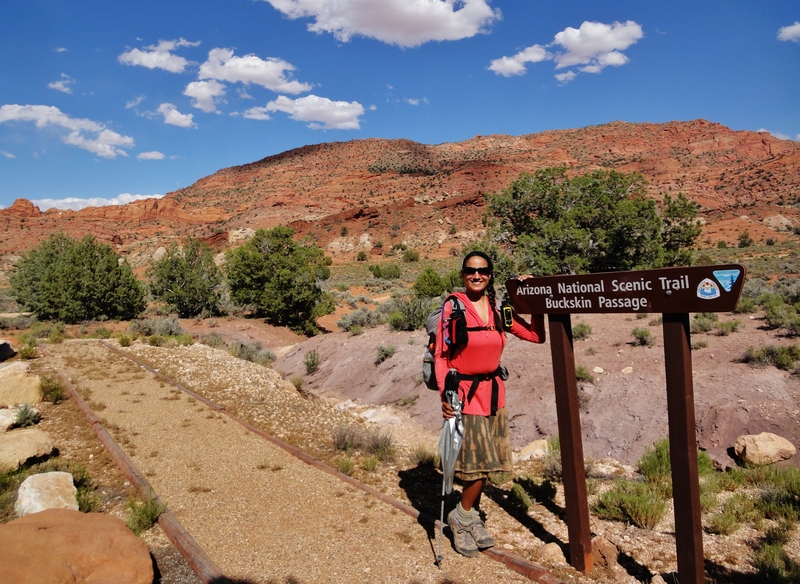 Arizona Trail Trek – Reached Utah on May 31st! 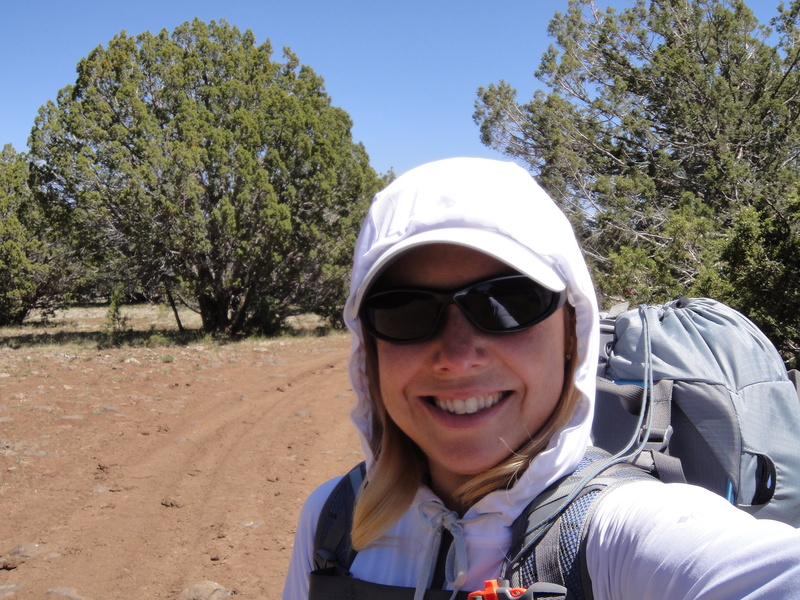 On May 31st after 2 1/2 months of hiking, events, fundraising, public hikes and backpacking trips and media appearances- I reached the Utah border! What an incredible feeling to have hiked here connecting my steps all the way from Mexico, over 800 miles away! 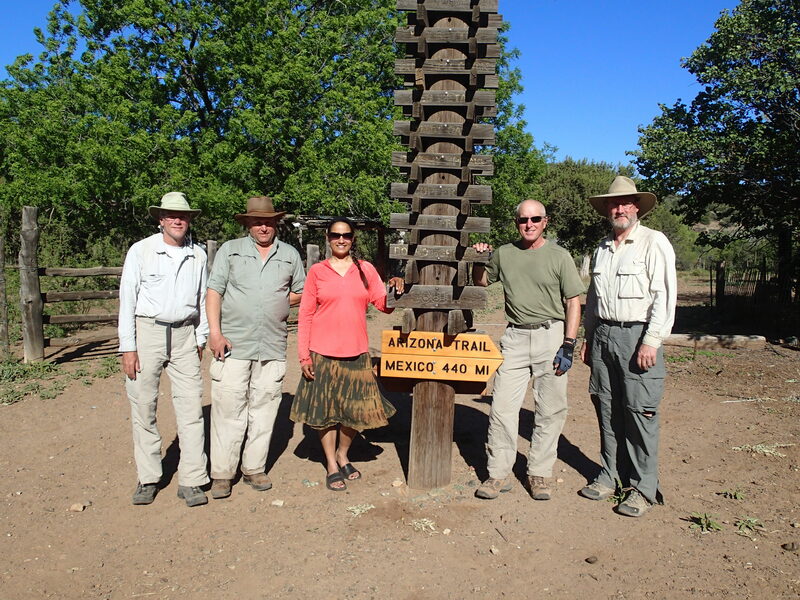 Monument 102 at the Mexican Border- seems like a long time ago! It was bittersweet to see the multicolored sandstone of the Coyote Valley and know that this journey would soon come to an end. 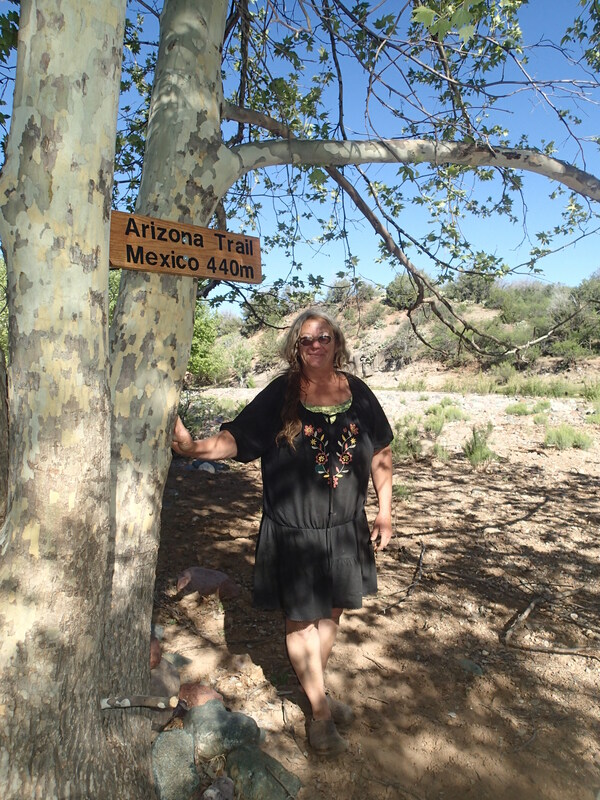 Exciting that I have now walked across Arizona twice! There was a big celebration at Sanderson’s Into the Grand in Page and Antelope Point Marina was kind enough to donate a houseboat for the evening. 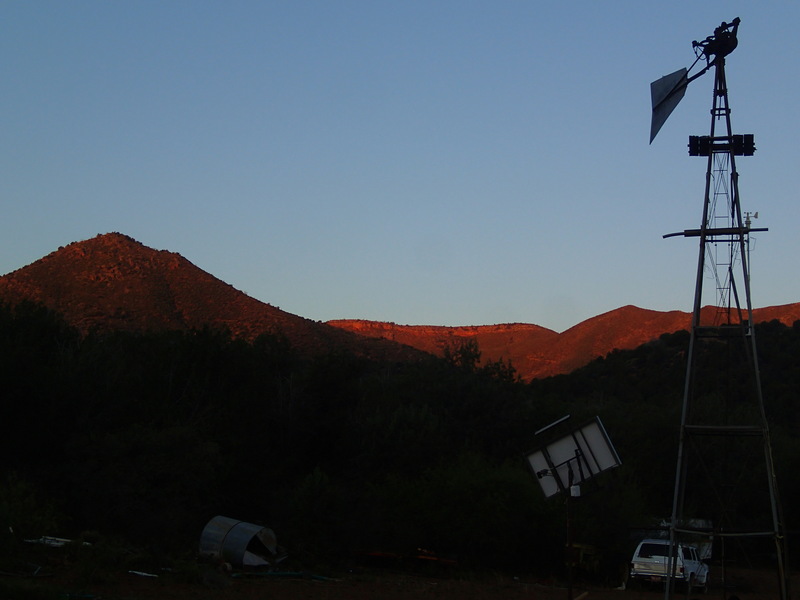 Now resting back at my home in Tucson, I will fill in the journals I didn’t have time for while on the trail. A big thanks to all who donated to the campaign- the total of Indiegogo donations and money raised at events came to $17,800!! 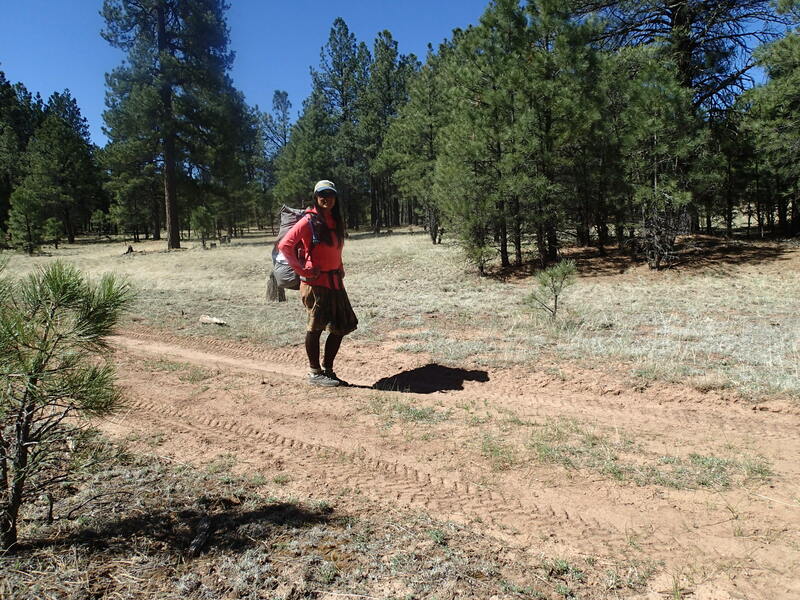 If you haven’t made a contribution yet and would like to, follow this link to donate to the Arizona Trail Association. 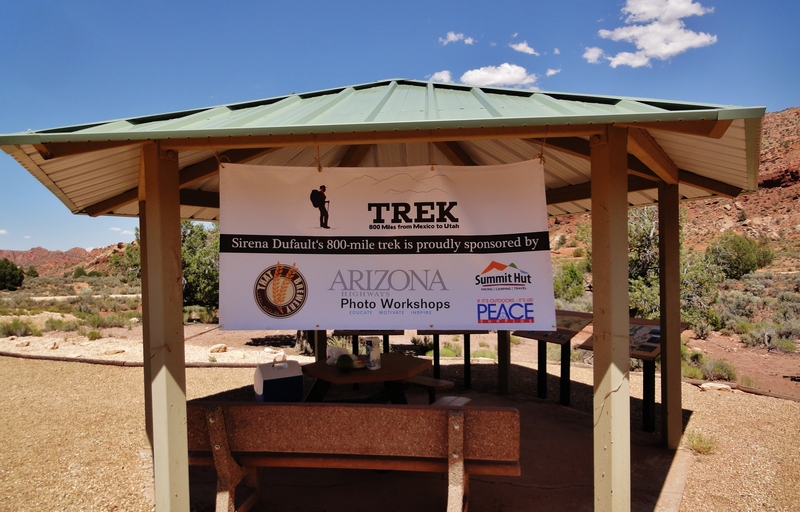 Many thanks also go to my sponsors Arizona Highways Photo Workshops, Summit Hut and Peace Surplus; and a special thanks goes to That Brewery for donating all that tasty Arizona Trail Ale for the Gateway Community Events! Thanks to all who participated in the public hikes, backpacks, and events- the turnout was better than I could have imagined and it was a pleasure to share the trail with so many folks. And thanks to all who donated their time, talents, and spaces for the Gateway Community Event series. So many people helped out with logistics, shuttles, lodging, etc, that it deserves its own blog post. But a special shout-out goes to my dad, who was here for two months being the best support crew a hiker could ask for, and my husband Brian, who is infinitely patient and supportive of my need for adventure. Now it’s time for me to catch up on my rest- I’ve got three weeks until my river season starts. It definitely softens the blow of being done on the trail knowing that I will spend the rest of the summer working as a guide on the Colorado River in my favorite place of all- the Grand Canyon! 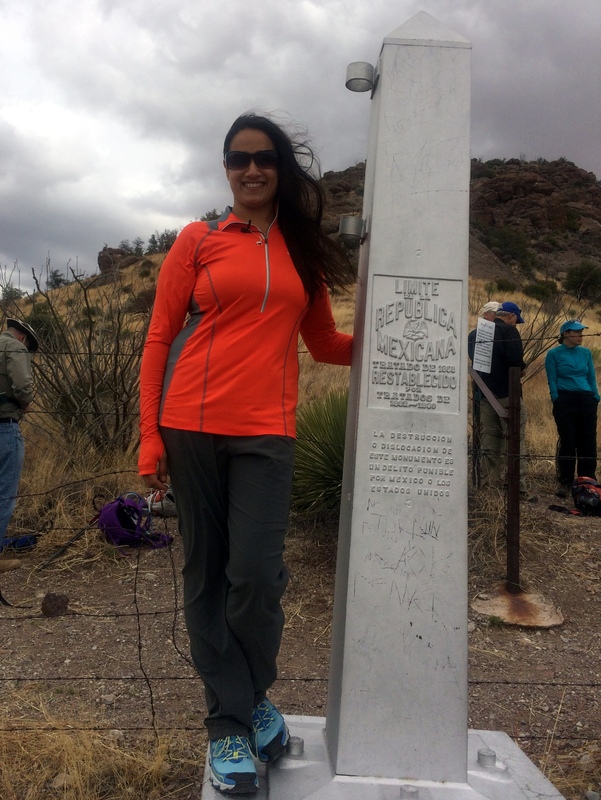 Here’s a Q&A that I did recently for Arizona Highways about the Arizona Trail Trek. The hike has been amazing- I’ll be finishing the trail on Saturday the 31st at the Utah border!! That night, I’m going into Page for a finale celebration from 6-9 pm at Sanderson’s Into the Grand- 148 6th Ave, Page (928) 660-8593. I’ll get to the rest of the blog updates once I return home. It’s been an amazing journey- thanks to all who have participated, donated, and followed along!! 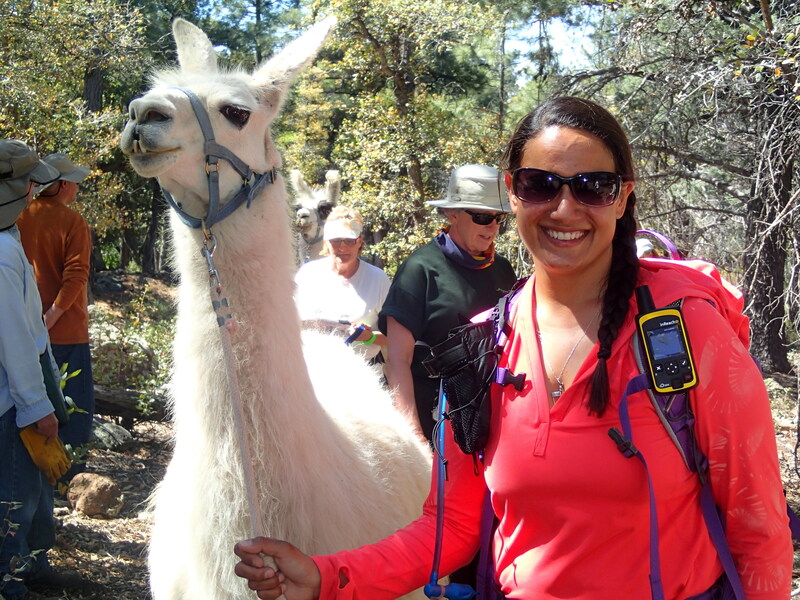 See you on the Arizona Trail!! 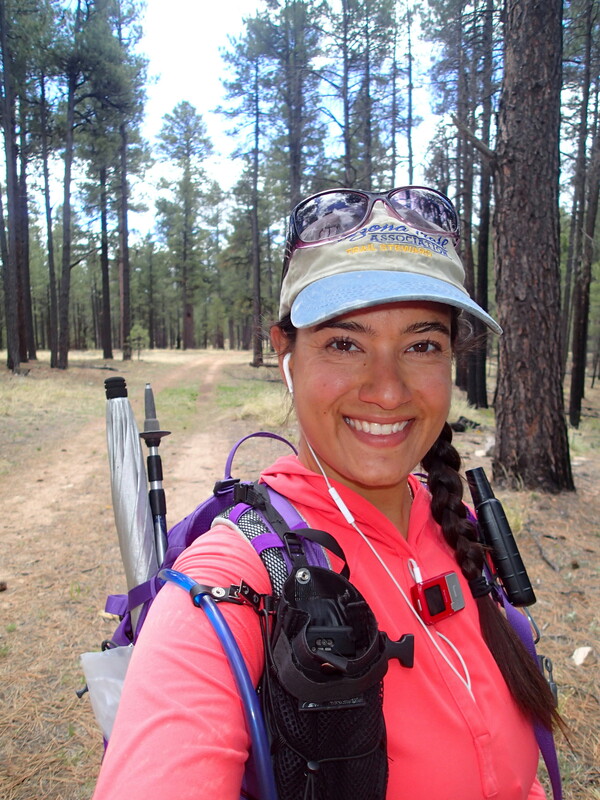 Back in March, we told you about Sirena Dufault, who’s hiking the entire 817-mile Arizona Trail to raise awareness and funding for the Arizona Trail Association, where she is a volunteer. 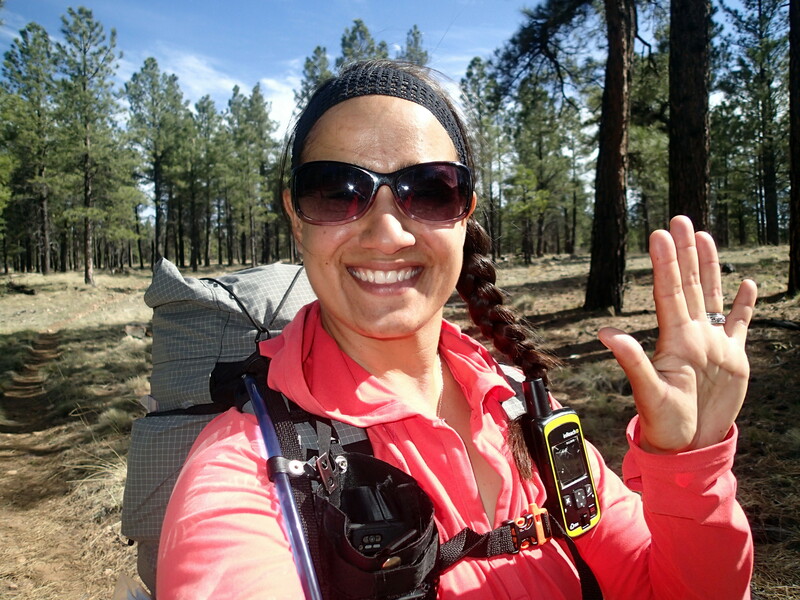 Dufault is nearing the end of her hike now, and we recently caught up with her via email to see how the trek was going. To see Dufault’s updates on her progress, check out her blog, and to contribute to the ATA, visit this link. What have been the highlights of your trek so far? 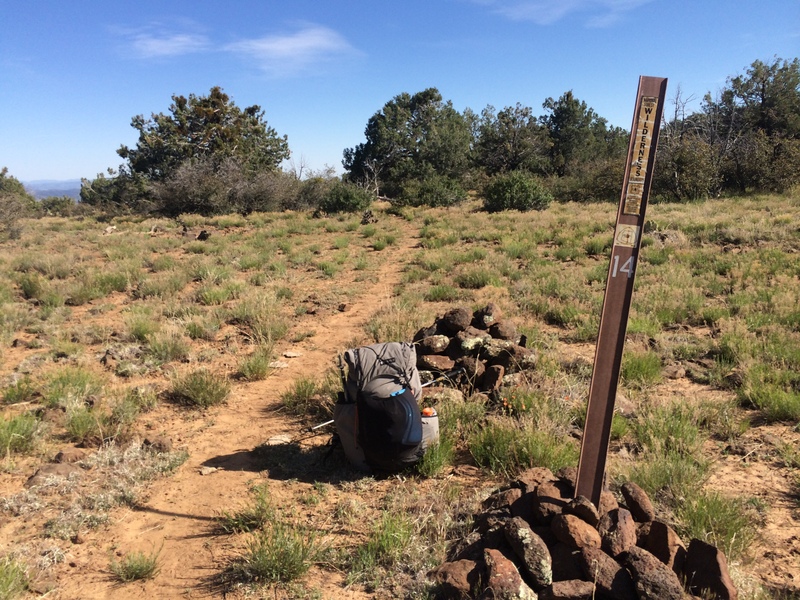 Just four days left to raise $20,000 for the Arizona Trail Association through our Indiegogo campaign- if you’ve been waiting to donate, now’s the time! 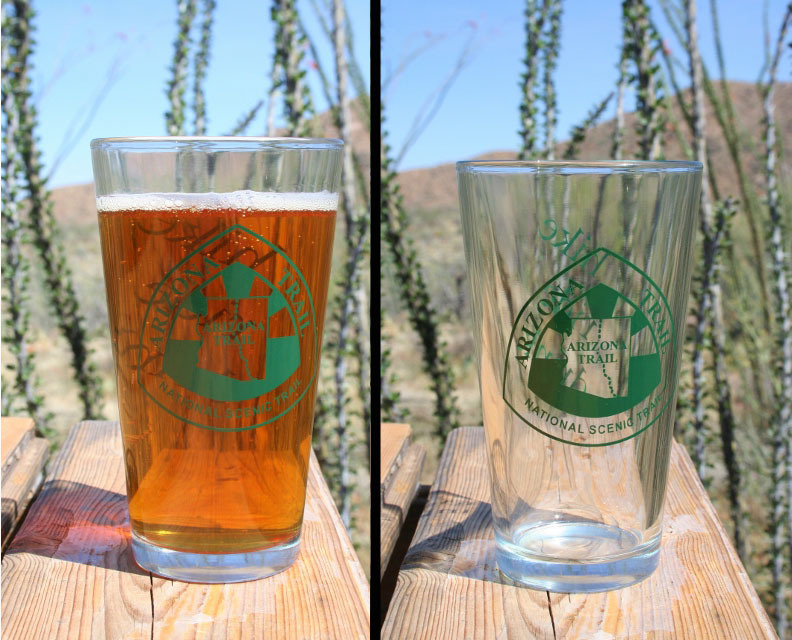 There’s special Arizona Trail pint glasses, signed art prints of Arizona Trail: Journey to Center, even a chance to help brew Arizona Trail Ale with Steve Morken from That Brewery- Click here to check out the incentives! After a night at Horse Camp Seep, me and my four hiking companions packed up and headed up the hill toward a rocky outcrop above the camp. As we got closer, I could tell that the view was going to be spectacular. 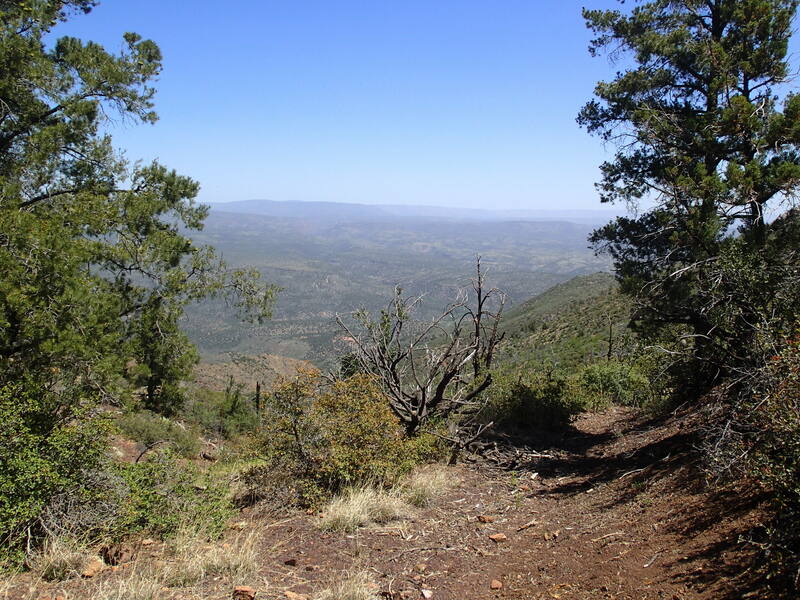 Even though it was a hazy day the 360-degree views are some of the best on the entire AZT. Saw a shadowy figure of the San Francisco Peaks still looking very far away. Incredible that I’m going to walk there. The trail to The Park was in good shape, and we took a lunch break in a beautiful stand of pines. Next up was the aptly named Red Hills passage. Beautiful red rock canyons and hills, up and down, up and down. There were pools in the drainages from the storm that happened right before our trip and we found a nice place to camp with a sunset view and a sliver of moon. 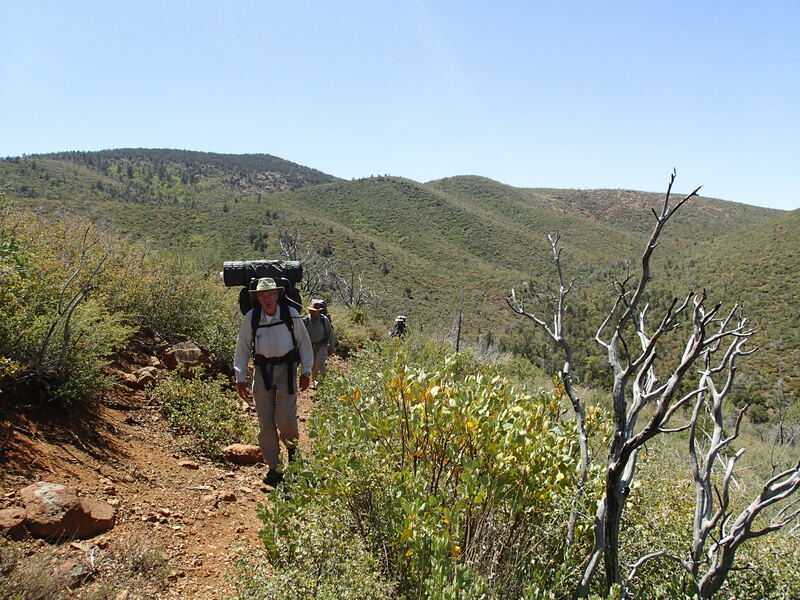 The next day we hiked to the Brush Spring Trail and were passed by a very fast thru-hiker from Oklahoma. He was amazed by the beauty of the state- I feel so lucky to call Arizona my home, all these incredible landscapes available to me whenever I want. Brush Spring Trail went through hills thick with green vegetation, thankfully the brush wasn’t encroaching onto the trail. The whole trail through the Mazzies was in much better condition than I had expected, it was nice to not have to climb over burnt trees or get scratched by thorny bushes. After a break at a nice campsite near Brush Spring, we climbed to a saddle overlooking our descent to the East Verde River. 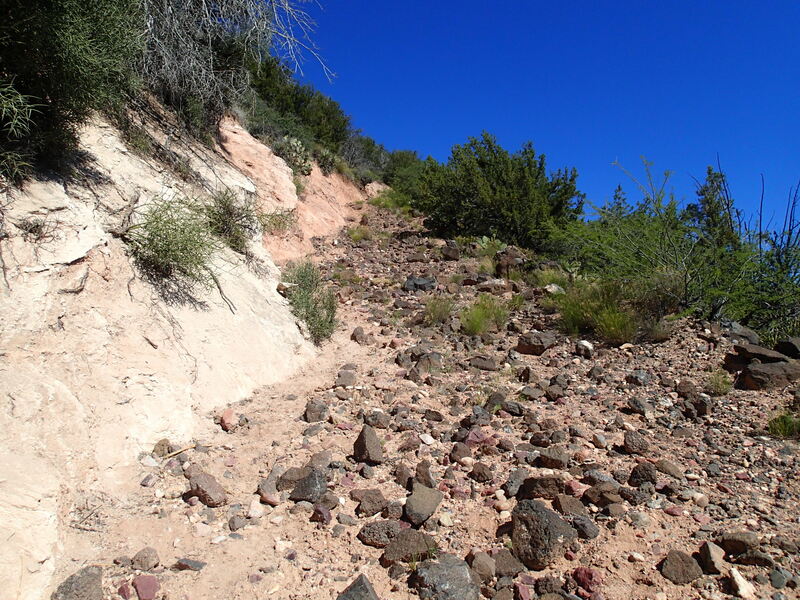 The trail follows an old road that plummets thousands of feet down to the LF Ranch. Temperatures got hotter and the umbrellas came out for shade. It seemed like it took forever to descend to the ranch. We heard the ranch before we saw it- the sounds of peacocks calling, cows mooing, and dogs barking. 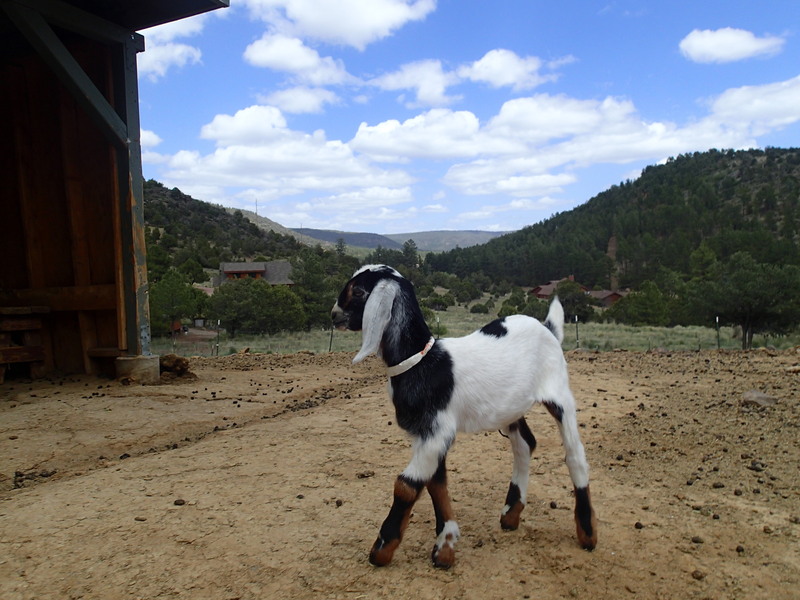 The LF Ranch is a working cattle ranch run by Maryann Pratt, completely surrounded by the Mazatzal Wilderness. 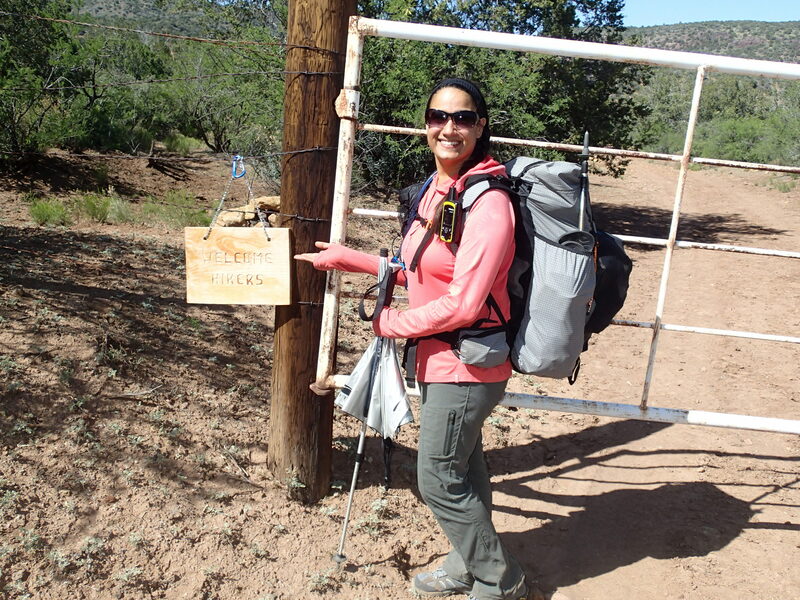 Maryann also welcomes weary hikers with a bunkhouse to stay in and home-cooked meals. I had heard about the ranch for years and was super-excited for my stay. 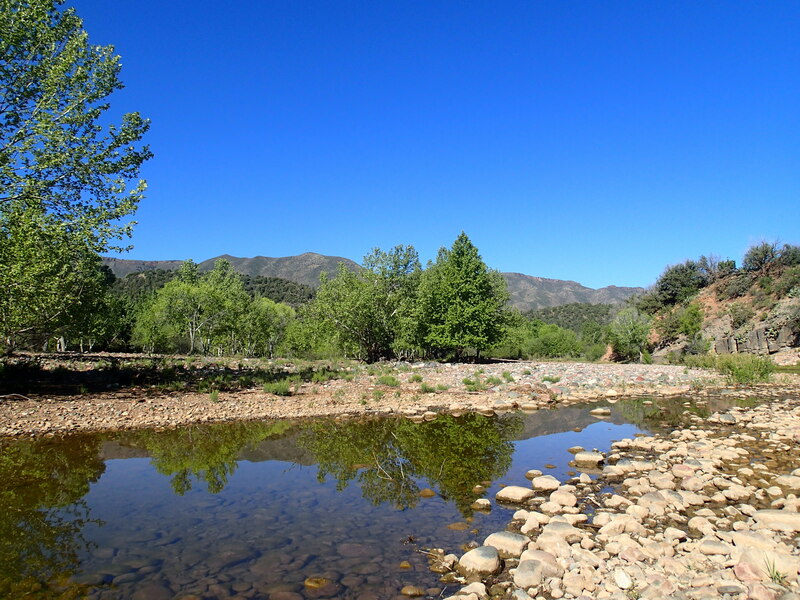 The ranch is on the banks of the East Verde River and we went to check it out. There was a great swimming hole and nearby the cool waters of Rock Creek joined the East Verde. What a place! Unfortunately for my travel companions, their trip was at an end and they hiked out the rough four-mile access road to their cars. It was a great group and I really enjoyed their company. 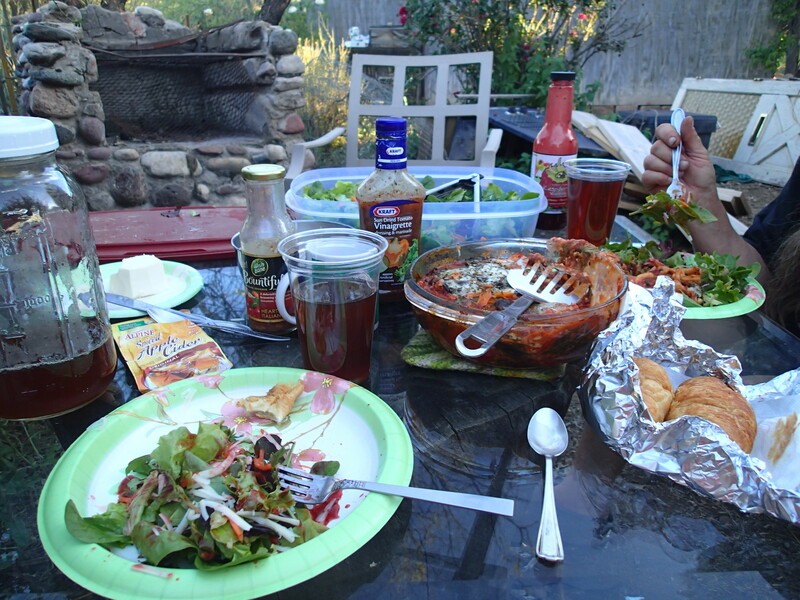 I went back to the river for a swim and relaxed until Maryann brought out the most amazing dinner- vegetarian lasagna, a giant salad, bread and pie for dessert! She knows the way to a thru-hiker’s heart for sure! I had an enjoyable stay in the bunkhouse and then Maryann fed me again, a wonderful breakfast to start my day. It was so hard to leave this sanctuary, I could have stayed for weeks, chatting with Maryann, swimming in the river, watching the peacocks, staring at the beautiful surroundings. If you’re coming through the area, plan an extra day, you’ll be glad you did. Visit www.lfranch.com for details and reservations. 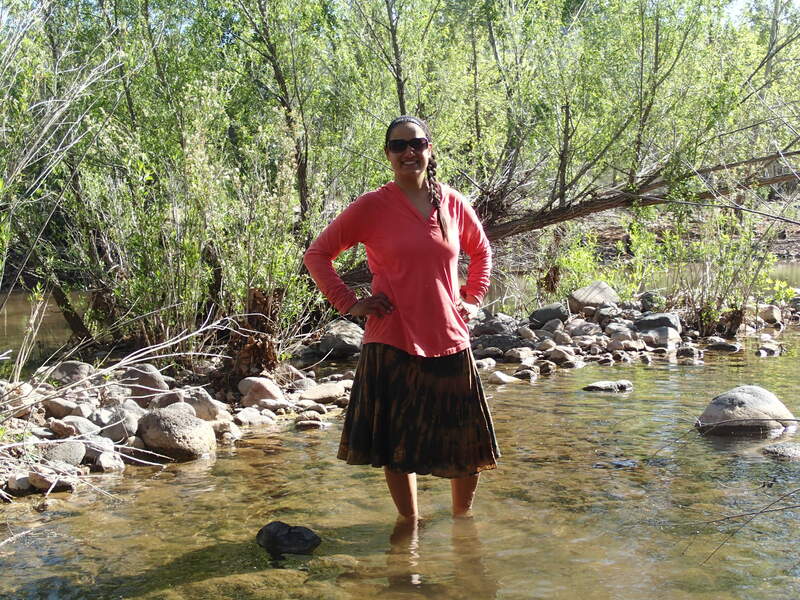 I hiked back to the East Verde crossing and spent way too much time lounging around on the banks, enjoying the river. I had a full day of climbing ahead of me and it was going to get hot. 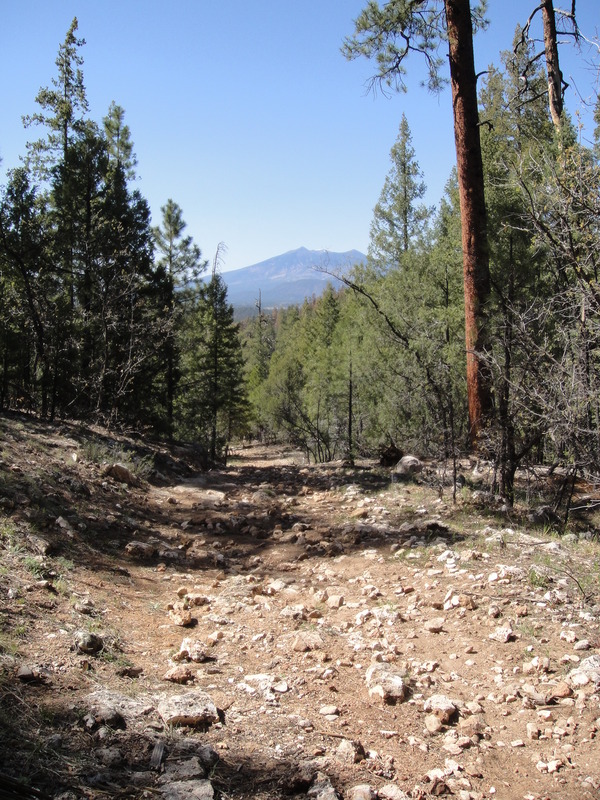 The Arizona Trail uses an old, steep, nasty road filled with softball-sized loose rock for it’s ascent from the river. It would be so nice to have new singletrack built, but projects like that cost money and for now, the road is the trail. 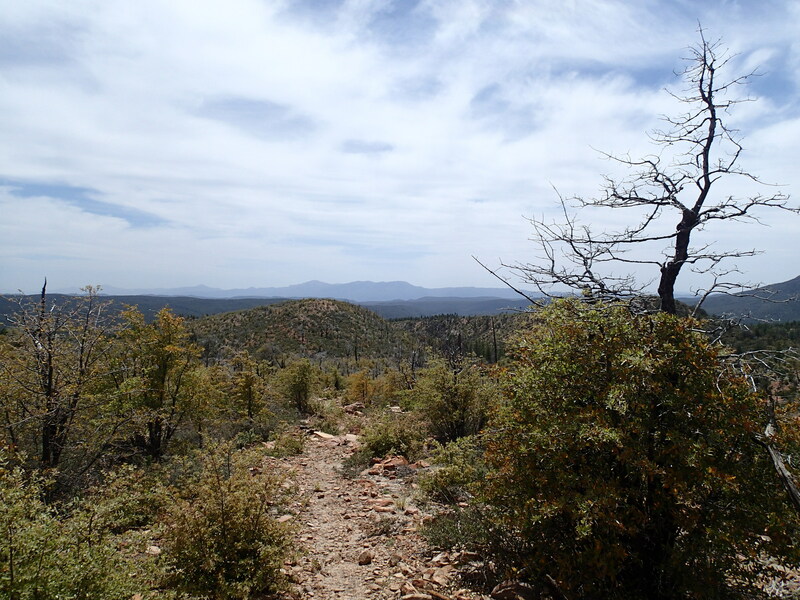 I ascended to Polles Mesa and hiked from cairn to cairn across the plateau. Then the trail came to Whiterock Spring, where I refilled my water. Whiterock Mesa is my favorite part of this passage, it has wildly shaped rocks that look like dinosaur bones contrasting with the red dirt. 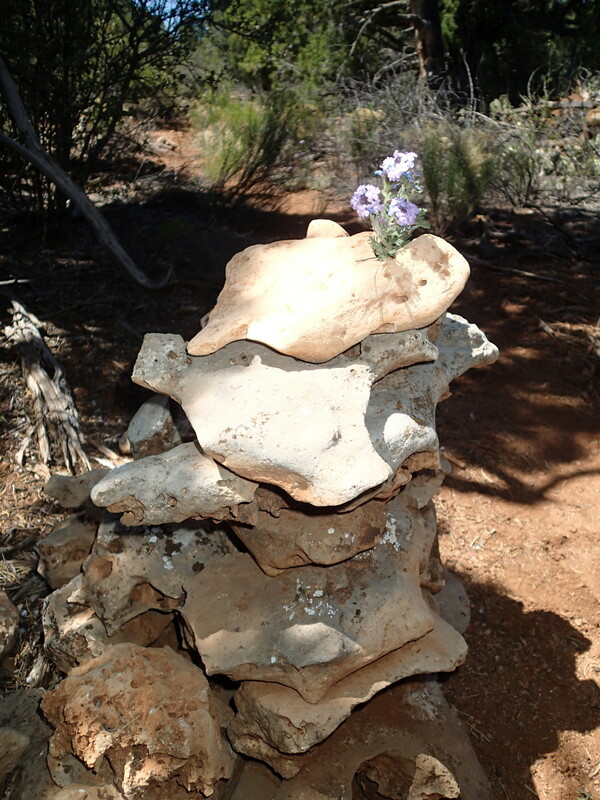 I found a cairn that I had built with a flower-holder rock from back when I hiked this in 2009. 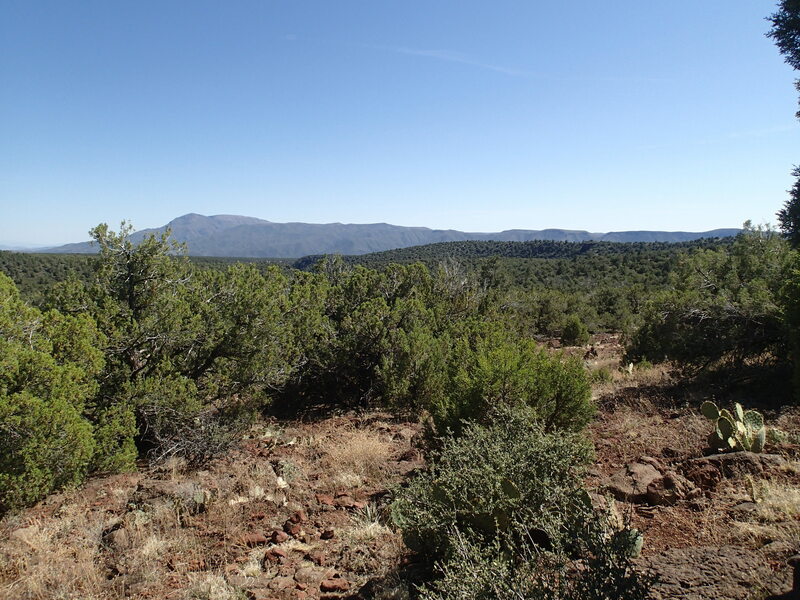 After Whiterock Mesa came Saddle Ridge, another field of rocks to navigate. 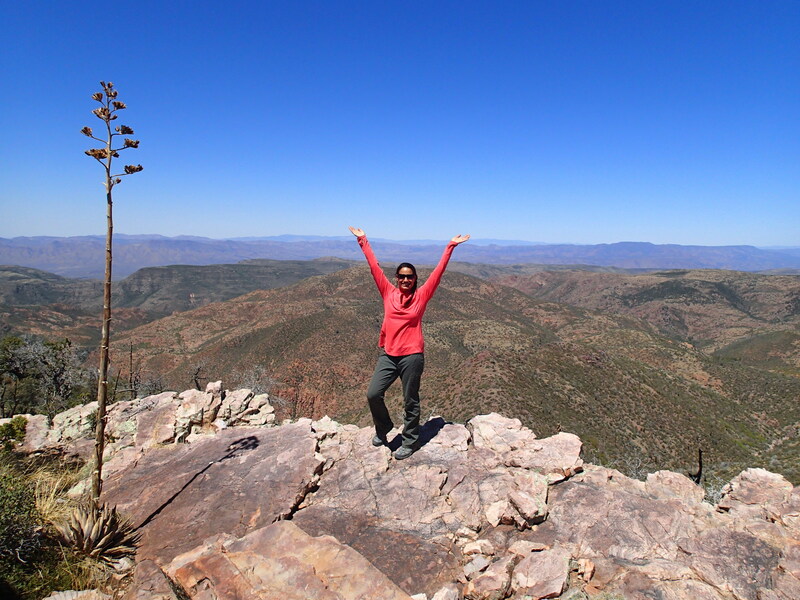 I climbed to the wilderness boundary and had a little celebration- I had just finished the last wilderness area on the Arizona Trail! Miller Peak, Mount Wrightson, Rincon, Pusch Ridge, Superstition, Four Peaks, and now the Mazatzals. My dad met me at the Twin Buttes Trailhead and took me into Pine, where I feasted on artichoke and spinach pizza from That Brewery. 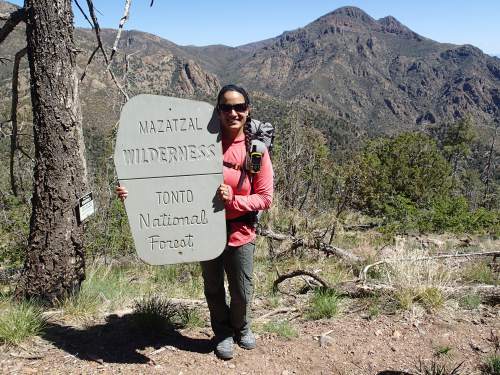 The Mazatzal Wilderness is a true gem of the Arizona Trail and I’ll be back to explore more for sure! 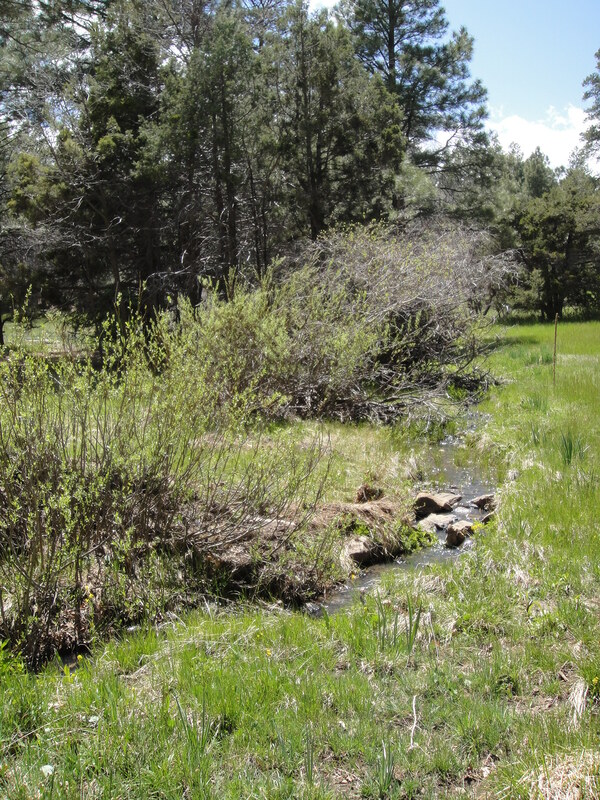 The next day I hiked from Twin Buttes into Pine, stopping at beautiful Oak Spring for a break by the water. 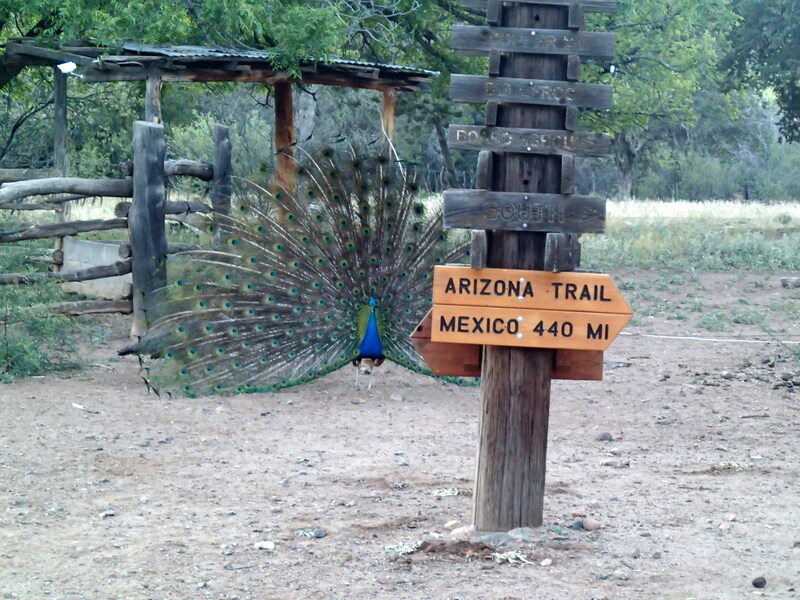 It was exciting for me to hike into the Pine Trailhead and connect my steps from Mexico to Pine. 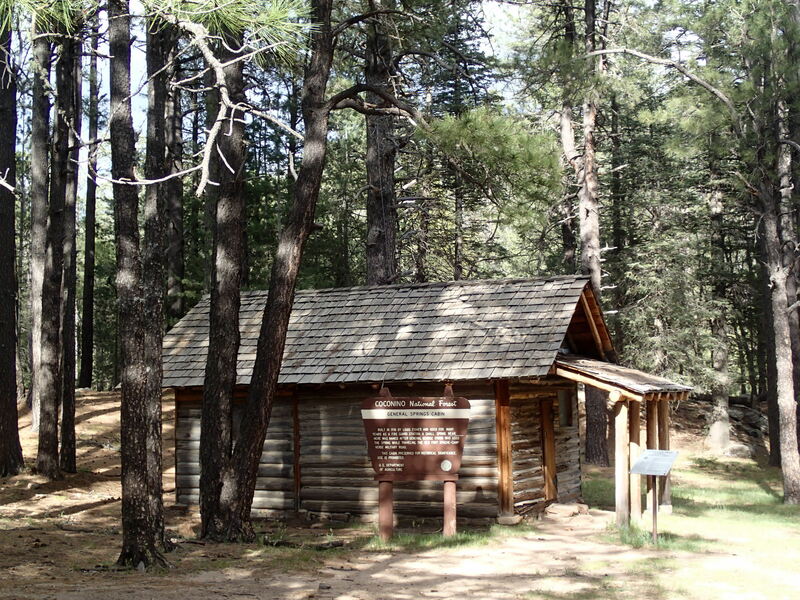 Love this little town nestled under the Mogollon Rim!